2018 Update: even though this post is awesome and contains a lot of information you can still use, it talks about the OLD course that was discontinued after the 2017 race. Read the tips below, and then head over here for the new course info. I am going to mark green the text below that doesn’t apply anymore. 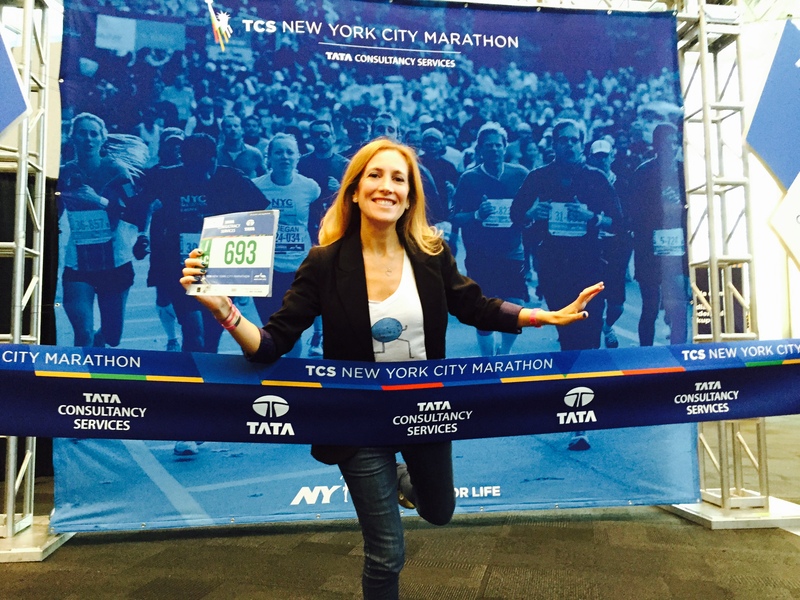 You know the “don’t wear anything new on race day” and all the basics… now, let’s do the United NYC Half Marathon as well as we can. I have done this race 8 times so far -from 2:06 in its first year, 2006, to 1:36 in 2016, and I keep running into people who haven’t raced it and have lots of questions (post in the comments section below if you have any questions not covered here!). 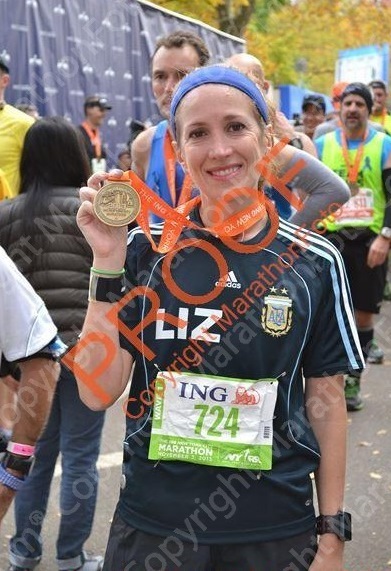 And in case you want to see photos and read my race reports, go here for all of them, or, here is the 2015 NYC Half report, here is 2014 NYC Half and 2013 NYC Half. Also, download the custom pace bracelet, I created for this pace strip based on the race strategy below. Make a race prep list of what you’ll need a week or two before and sort it all by stages, here is a Marathon Packing List to start with. Whether you’re traveling or not, get everything in the list ready as soon as possible. Start prepping 2 weeks out. Plan your nutrition waaaay ahead. You can buy gels at the expo if necessary, but get bagels/oatmeal/bananas and whatever you need for race day the day before as there will not be a lot of delis open at 4, 5, or 6 am. Some may be, but not a lot. 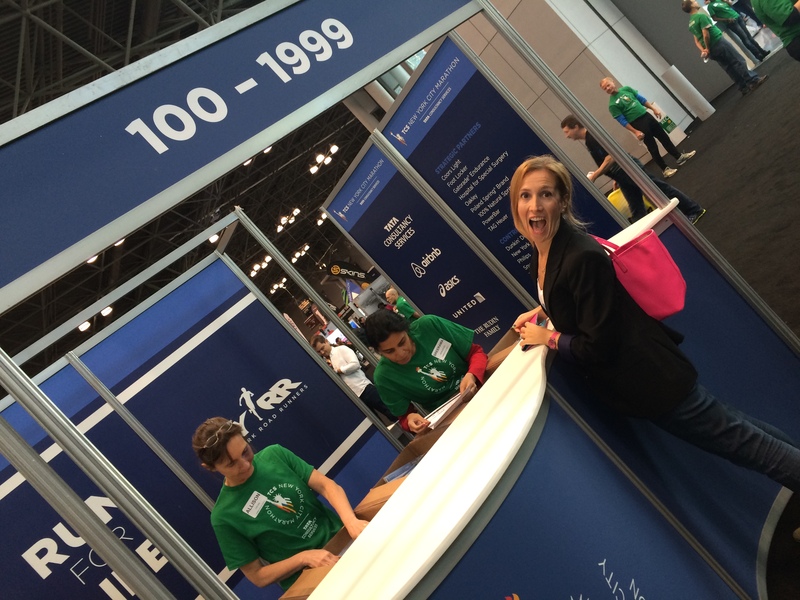 If you need any last minute thing, you can buy most stuff at the expo/bib pickup (don’t forget to bring a printed copy of your reg form –download it from your NYRR profile they will be ready early March, and photo identification) or here is an organized list with all the running stores by area. we all look like weirdos anyway, wear old stuff you have to discard to the start of the race! lace with a safety pin!) during the first mile too! Go to the dollar store and get knee-high socks, cut the foot and you’ll have throwaway arm warmers! I keep half of it on until I warm up, it can be windy and cold at the start! Gear/What to wear… the weather can be anything from 50s to 20s so prepare (aka, train in) a few options and decide the day before. Or that morning. Be smart, and make sure you can peel off layers comfortably. If you don’t want to carry your phone, at least carry a $20 bill, a metrocard, and an ID with you, just in case. My rule is if it’s over 40 degrees, I do just singlet and shorts (pics from last year). 2012: 47 DEGREES, 90% HUMIDITY, WIND 3 MPH. Temperature has been pretty consistent… but, you should assume it’ll feel 10 degrees under that temperature (hey wind!). So, depending on the wind/humidity/lack of sleep/whatever, you can add hat, arm sleeves, leg warmers, etc. Always add things you can get rid of easily and won’t miss. If you’re not sure about a layer, keep in mind that once you leave the park and get to the West Side Highway, it can get a little windy there. Check the wind direction in the morning! Best tool to have at any race: your name on your shirt, do not even question this!! If you don’t want your name, write something funny you’ll want people to scream to you all over the course. This is a big race and there will be a lot of spectators along the course and having them scream your name will make your race 100 times better. If you don’t want to ruin your gear, and are not super crafty or into going to Michael’s, cut the letters out of duct tape (like I do!) and voila, they’ll peel right off! Headphones or not? If you are used to racing with headphones, bring them. I sometimes leave them on my ears (with the music off), and turn them on only when necessary. Central Park will be CROWDED, seriously crowded, so it’s smart to keep the music off, or very low so you can hear people around you. Once you are in the West Side Highway, and if it gets a little monotonous for you, go for it. You’ll have a lot of people cheering and you don’t want to miss it, but if you do have the music on later on, still make sure you can still hear what is happening around you!!!! Okay? 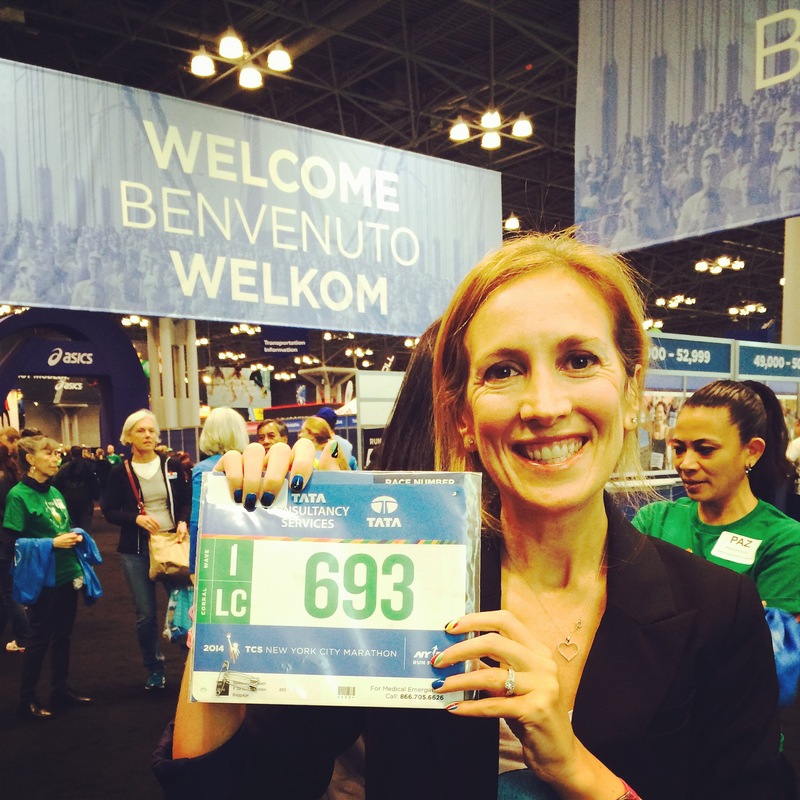 Oh, and have them download the NYC Half mobile app (will probably be ready to download a week or two before the race) where they can track you and a few more runners at a time. Get yourself the custom pace bracelet I created for this race based on the race strategy below. If you need a short run before the race, go to Central Park. 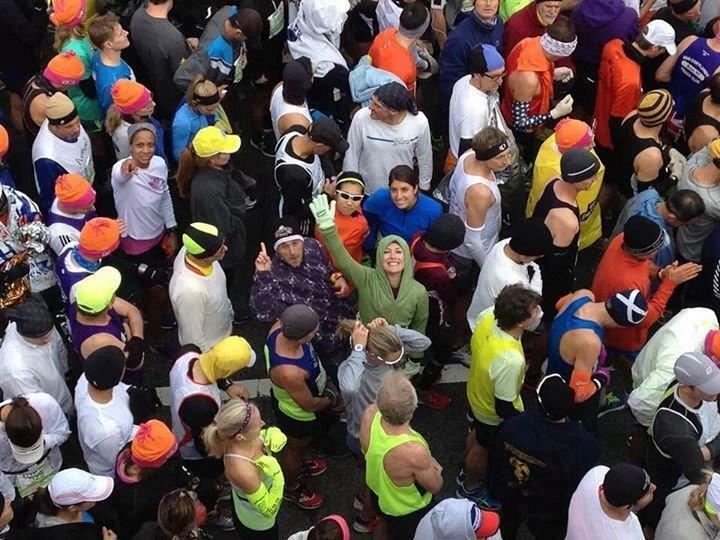 You’ll see many of your race-buddies and get to enjoy the best place in the world as a runner. Getting to the start/Baggage Check. The easiest way to get there is always a cab or running there of course, but if you have to take the train, take anything to 57th or 59th streets or any of the trains that leave you close to Central Park South/59th st. You will have to enter the park through Sixth or Fifth Avenue. Check the Start Map carefully. Before entering, check your (nyrr provided plastic) bag outside of the park (on 59th Street, between Fifth and Seventh Avenues). Give yourself ample time (as this is weekend schedule) and check MTA for weekend alerts, or try any subway app: make sure your train is running! Also, if you are not sure, I am 100% confident that if you just head over to the closest train stop, you’ll see someone you could follow to the Start 😉 // Kiss your loved ones buh-bye, they won’t be allowed anywhere close to the Start! During the race, the course WILL be crowded, so PLEASE, if you need to stop for a walk or move sideways for water, please please please signal with your arms, and look around behind you before you make any moves, DO NOT just stop or go sideways. 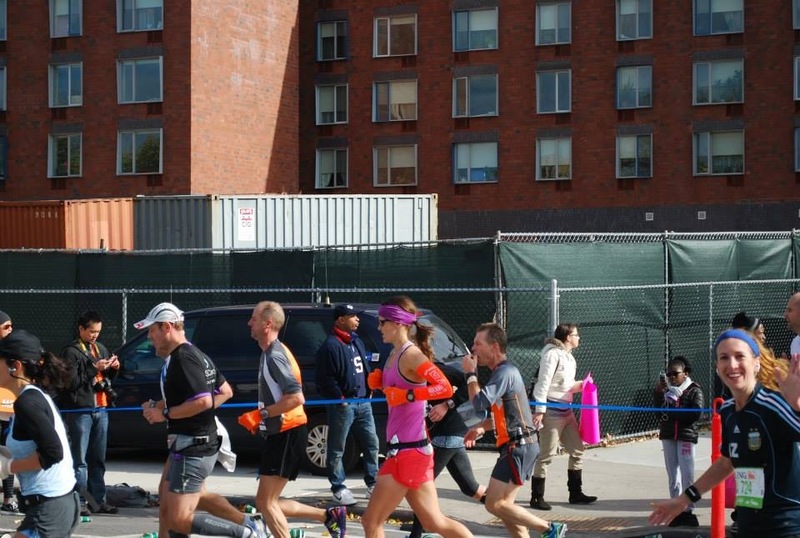 Be considerate of your fellow runners who could trip! The good side of having all these people around you that you’ll always have someone to run with, pace off, or follow when you’re tired. Pick them up when you feel strong, encourage them when they need it, and keep your eyes peeled for anyone who might need help!! There will be Water/Gatorade around every mile or so, so if you miss one, don’t stress. Don’t go for the first table as everyone will do that. There’s many tables: go to the last one. You’ll find the portapottties where the water is, so keep an eye out and don’t dart sideways! 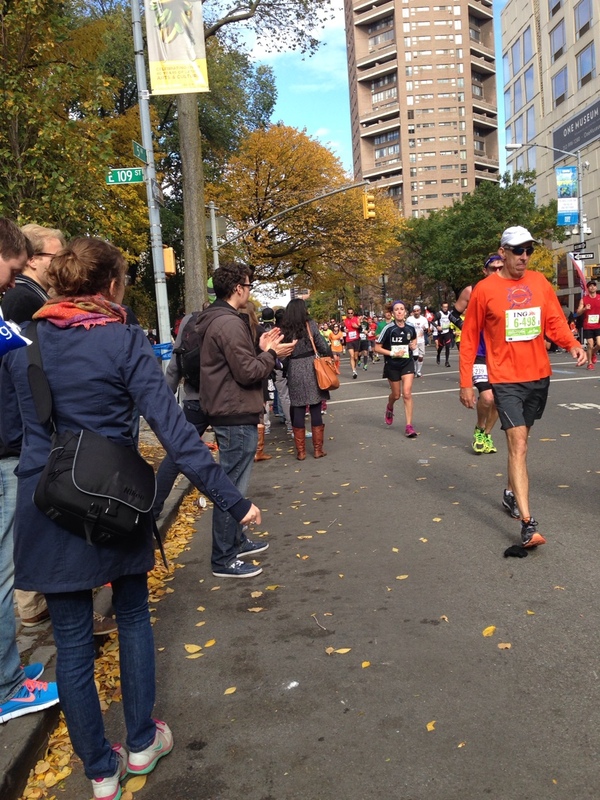 There will be Gels at mile 7.5, on 42nd street between 10th and 11th avenues, on your right. 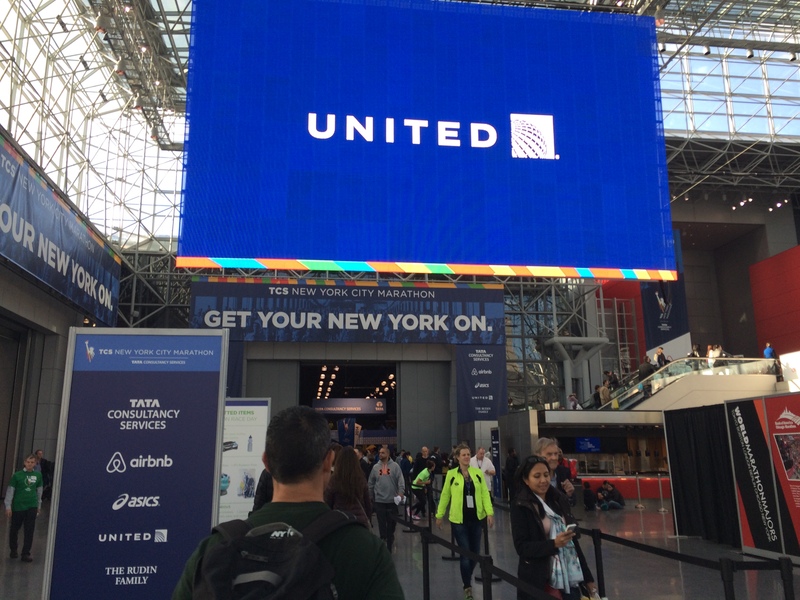 Think about joining an official pacer from the NYRR Pace Team, they’ll be wearing their signature white and blue striped singlets, and will run even splits through all 13.1 miles of the United Airlines NYC Half. Pacers will lead runners to finish times at every five-minute interval from 1:20 to 2:15, and will also offer a 2:30 pace group. 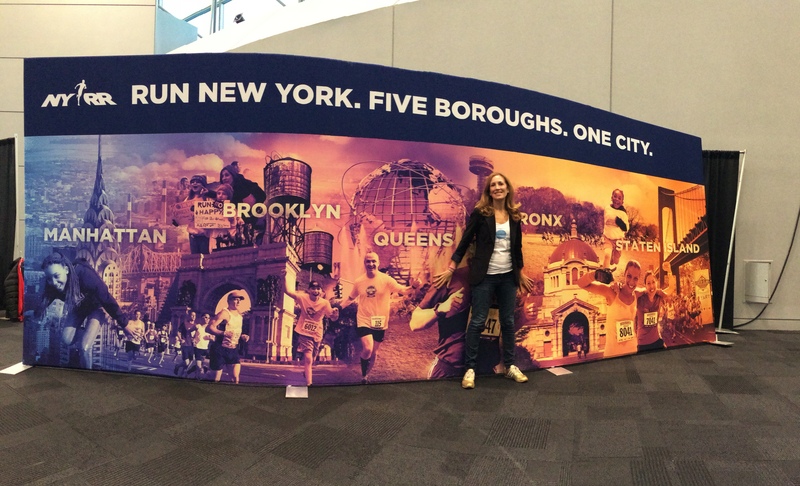 You can visit the Running Lab at the United Airlines NYC Half Experience Presented by New Balance to meet the pacers and learn where to find them on race day (I will be there Saturday morning, so come find me and say Hi!). 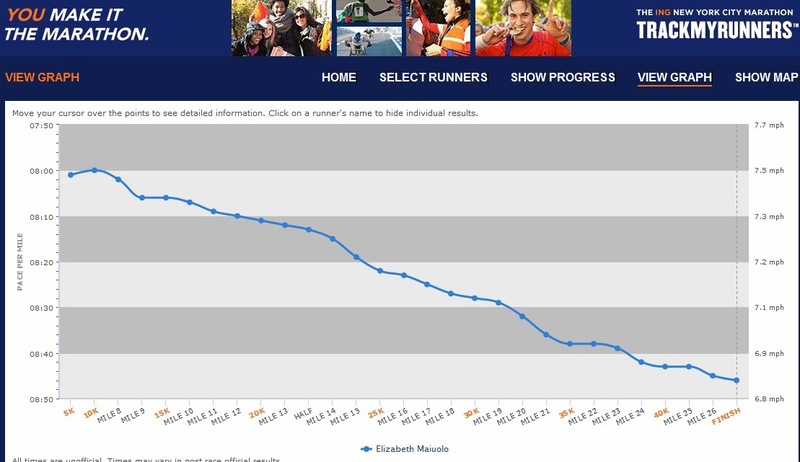 Elevation profile from my 2014 race, same as all the last ones of course. elevation is the red line. This is an easy race to figure out. 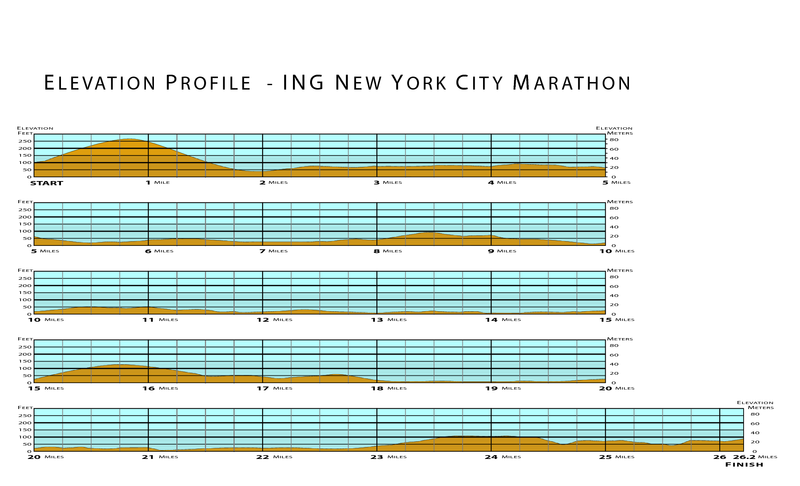 Basically, you have two parts: the undulating Central Park (first half) and the straight and flat run to the finish (the second half). Which makes it a perfect course to NEGATIVE PR!!!! Break the race in parts, device a plan, and stick to it no matter what. 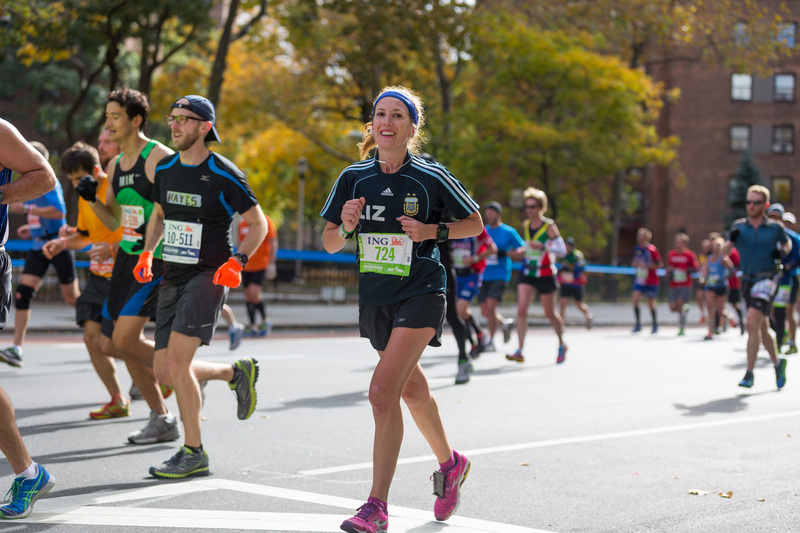 Plan for negative splits: keep it strong and conservative throughout the park and ram it home once you leave the park. It’s super simple. 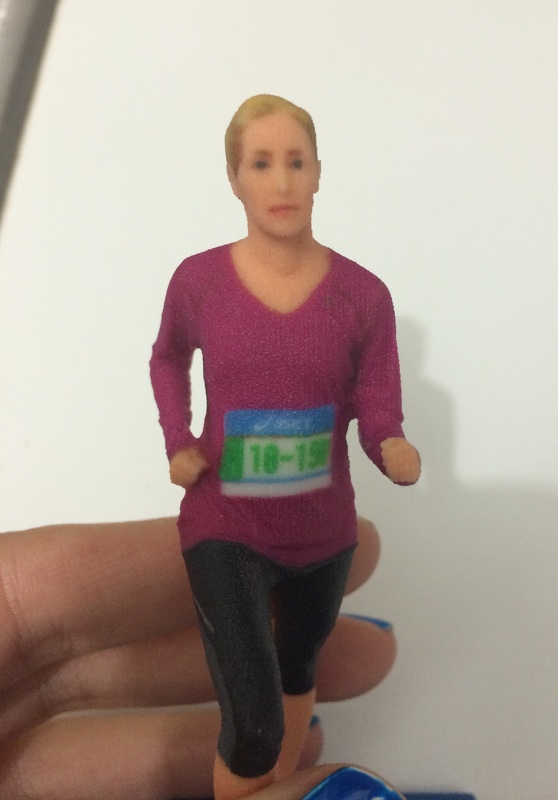 I am an average runner and have negative split in this race every time. Basically: you have to believe in yourself and wait for the time of your life. This is how I like to break this race down. In 4 parts. 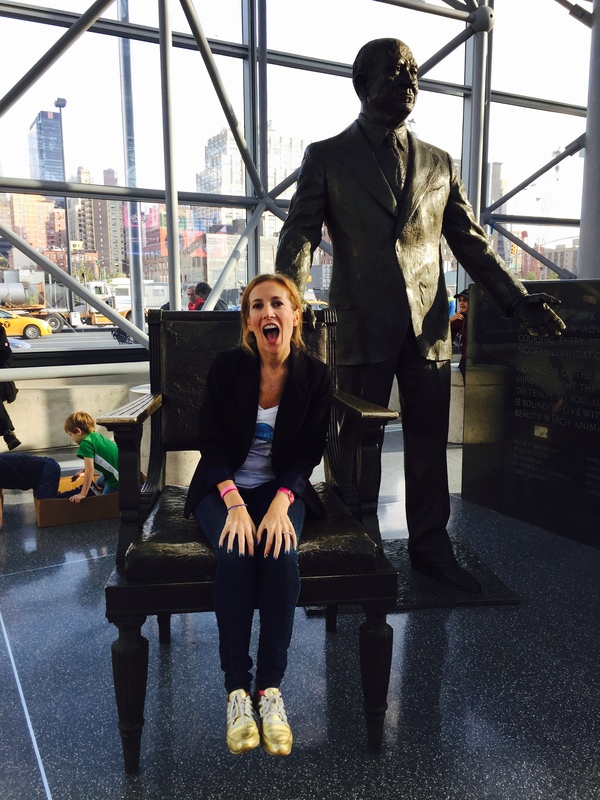 Part 1 – Mile 1: HOLD YOUR FREAKING HORSES!!!! The park is a string of undulating hills, but after Cat Hill you have the longest flat stretch, almost a half mile (heaven…!) so, use that to get on a rhythm, find your legs and a pacer. It’ll be crowded so I doubt you’ll be able to utilize the tangents well but at least avoid tripping, did I mention it’s gonna be a bit CROWDED? Your goal for the first half of the race is to exit the park in one piece, feeling strong, to let it all unfold in the second part of the race. Exercise all your patience here and keep yourself in good checks to not let yourself go. 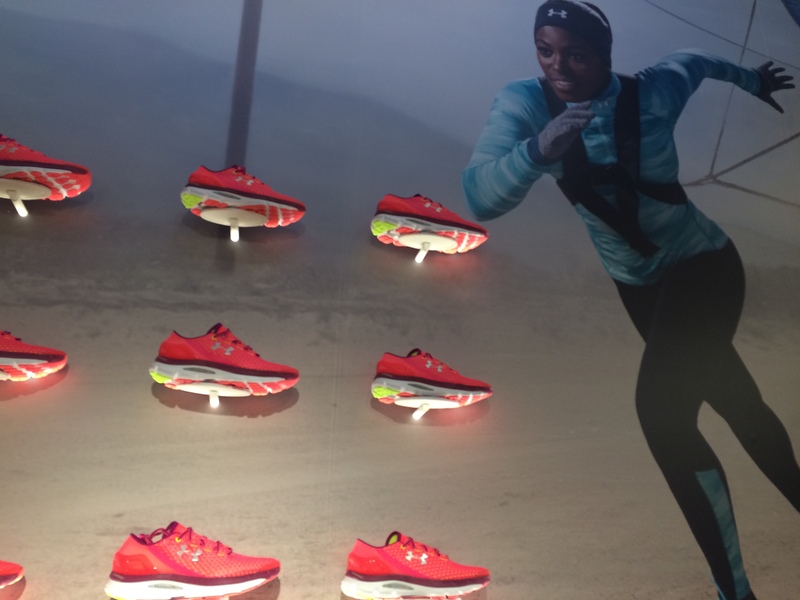 If you are running “hard-comfortable”, you are doing it right. Blip 1 in the course profile is 0.36 of a mile and a rise of ’33. You exit the park for two blocks, go around the Frederick Douglass Circle and come right back downhill. Then you -re-enter the park, make a right, and start the climb for Blip 2: Harlem Hill!!! HH is 0.32 long but it has a 84′ rise (average grade of 4.4%). Fun times. As soon as you finish the downhill on the back end of HH, there’s another climb, Blip 3 is 0.60 of a mile and has a rise of ’58. Blip 1 is short and mild, blip 3 is longer but mild as it’s stretched out, but watch up for Harlem Hill, short and UPWARDS! 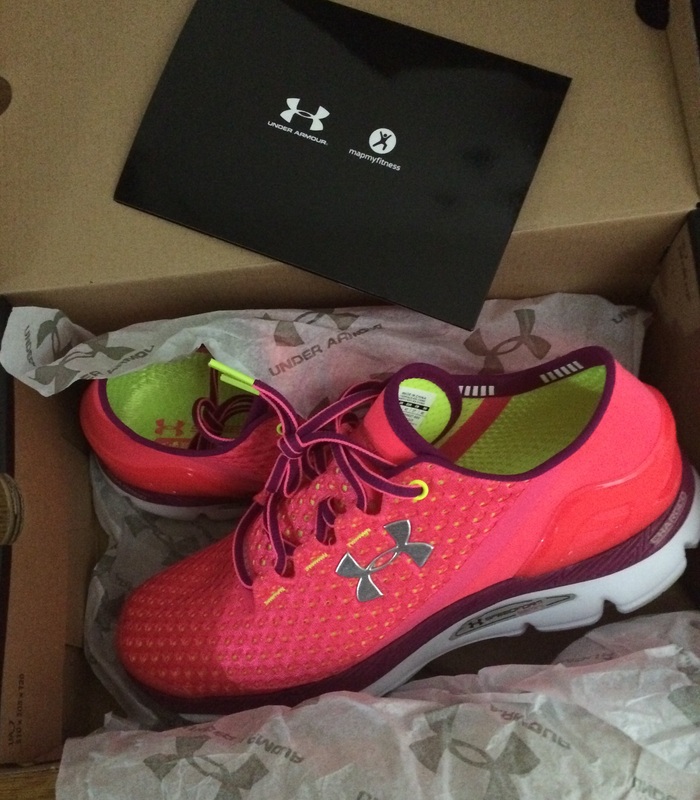 Part 3 – Mile 7 to 10: IT’S ON! This is where I like to stretch out my legs: the race starts HERE. From now on it’s flat and steady. When you exit the park you’ll have a lot of space, cheering and excitement to carry you on, and as soon as you turn right on 42nd, you’ll be rolling down. Hit the gas. Note: Something about Times Square can make you or your gps go crazy. Ooops. 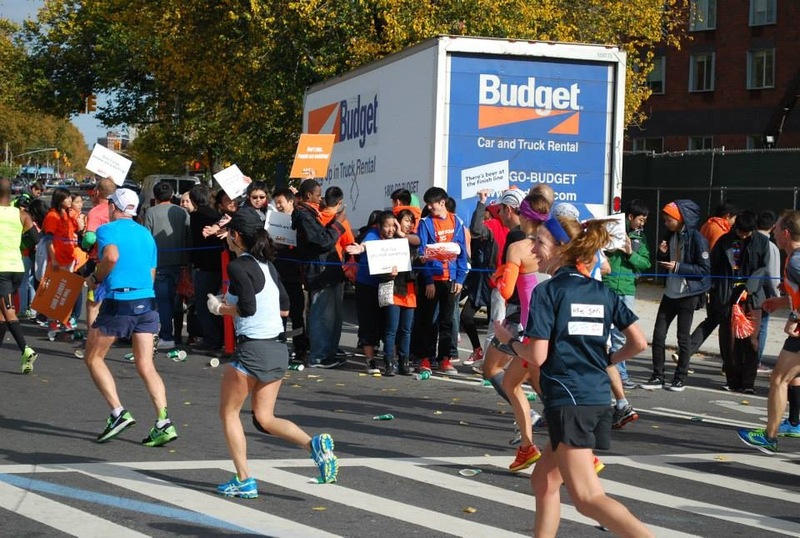 No, you’re not running a 3:20 mile. I set my gps watch to manual and I lap it myself when I see the mile markers. Way safer! That is all. Go Crazy. Bring it in. Drop the Hammer. As you can see in the map, I obv didn’t have gps on the tunnel, and you won’t either. But it won’t matter, when you get to mile 10, or 11 or 12 and you know you’re ready to start your KICK, you go. Keep in mind there’s a little climb out of the tunnel, short but steep, and then there’s not a lot left to go. Hopefully you’ll see the 800 meters sign if you’re focused but who is at my that point? It’ll seem like forever but once you’re out of the tunnel the finish line is RIGHT THERE. Walk, get your medal, take pictures, get your stuff, find your friends/family, go get brunch (there are many good places downtown), enjoy, stretch, ice bath, rest, eat more, sleeeeeep! 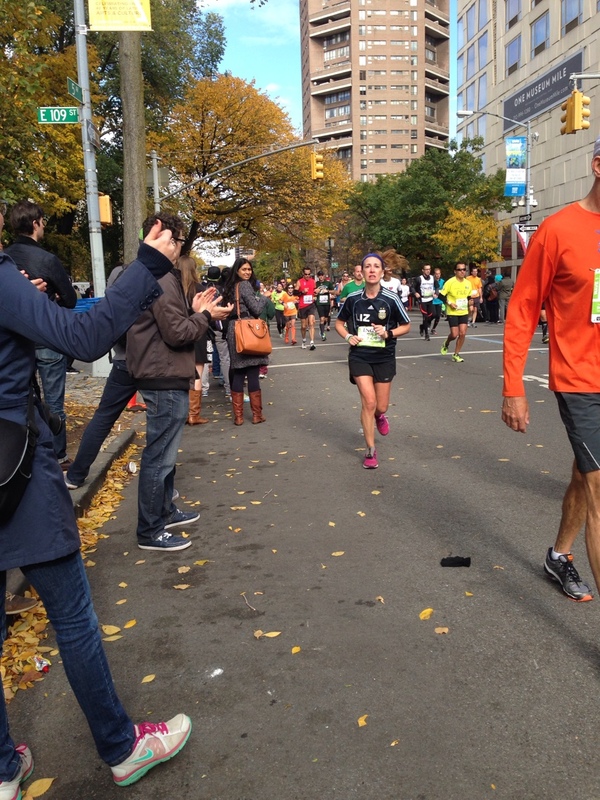 Tell everyone about your race, plan your next race, have a congratulatory donut. Or at least that’s what I am planning to do!!! I’d suggest checking the Finish Map also (mostly if you want to meet up with people afterwards). 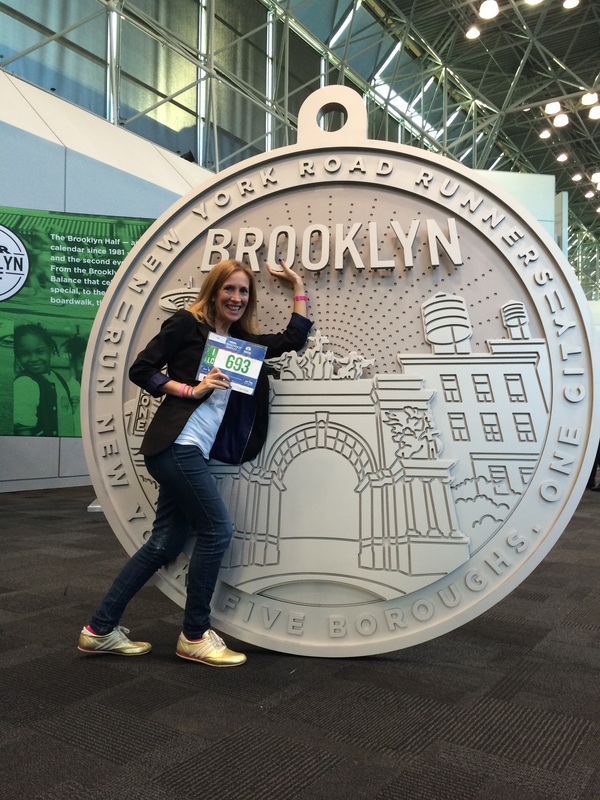 Also, post race, if you’re a NYRR Member: Join NYRR at the NYRR RUNCENTER featuring the New Balance Run Hub after the 2017 United Airlines NYC Half for complimentary finisher medal engraving! 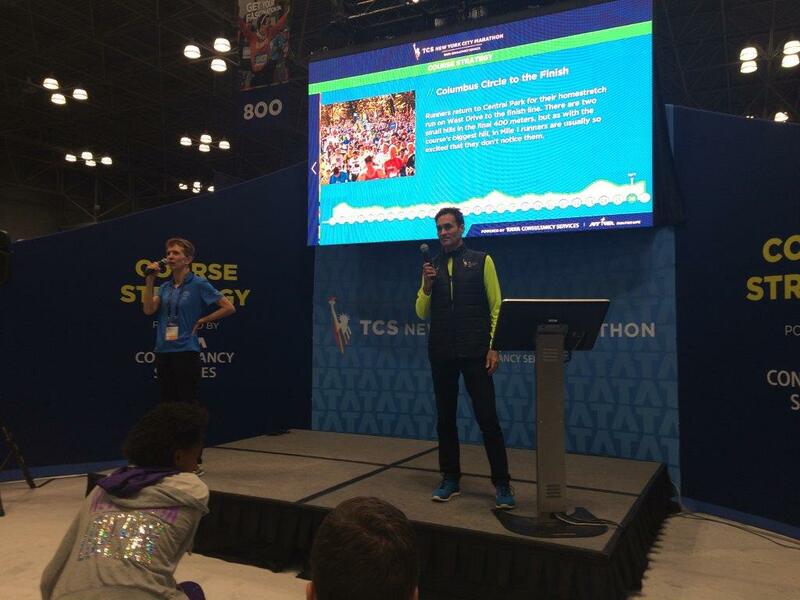 Sunday, March 19: 11:00 a.m.—5:00 p.m.
Monday, March 20: 11:00 a.m.—6:00 p.m.
Bring your NYRR Member Number. Can’t make it Sunday or Monday? 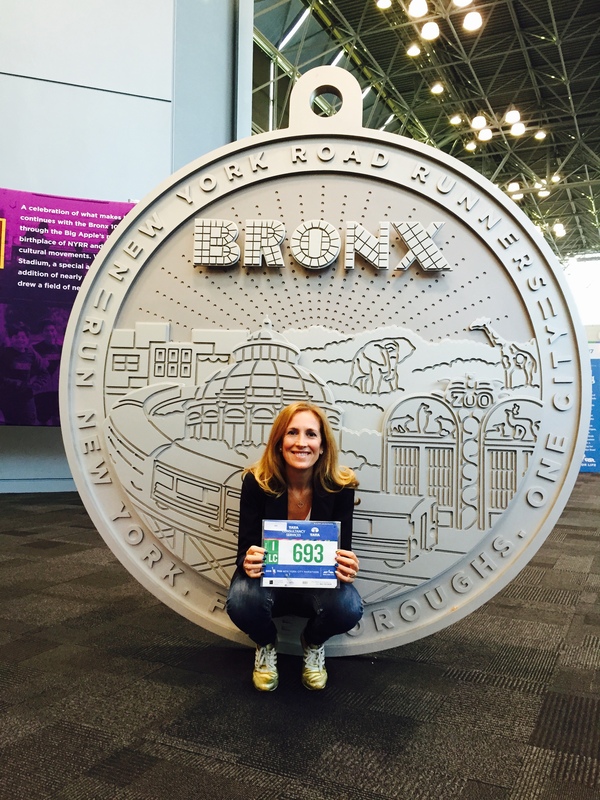 Send a proxy to have your medal engraved; they’ll just need your NYRR Member Number. Questions?? Anything to add? Anything you want to go over? Lmk in the comments below! 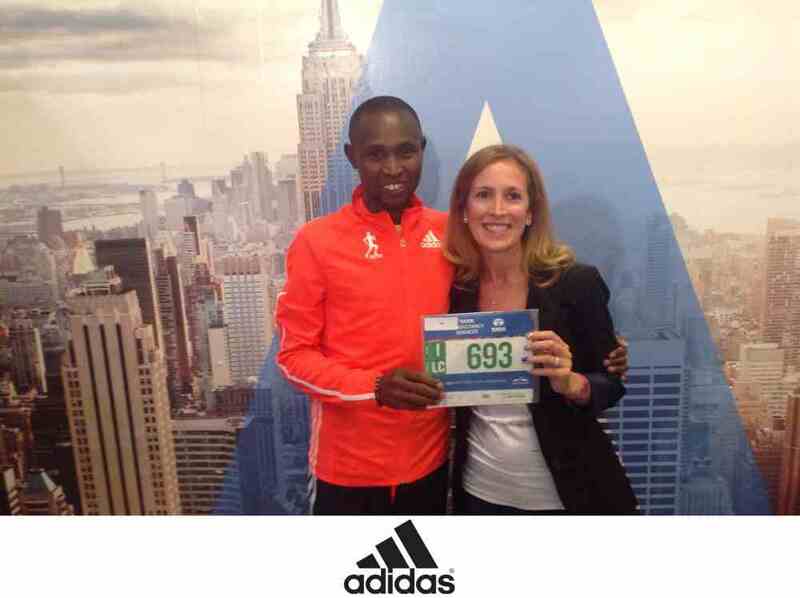 Photos race reports, go here for all of them, or here for the 2015 NYC Half, 2014 NYC Half or 2013 NYC Half. Get the custom pace bracelet maker, so you can plan your splits and stick to them! 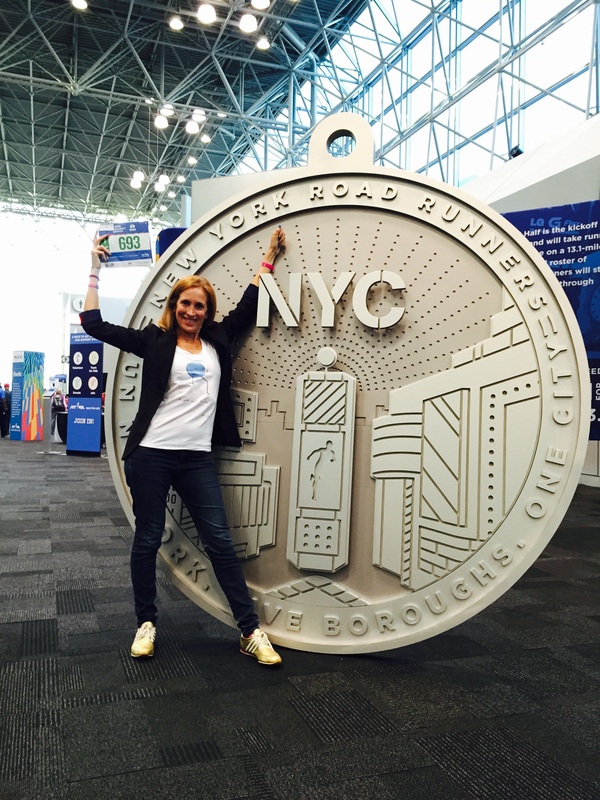 The official United New York City Half Marathon website. 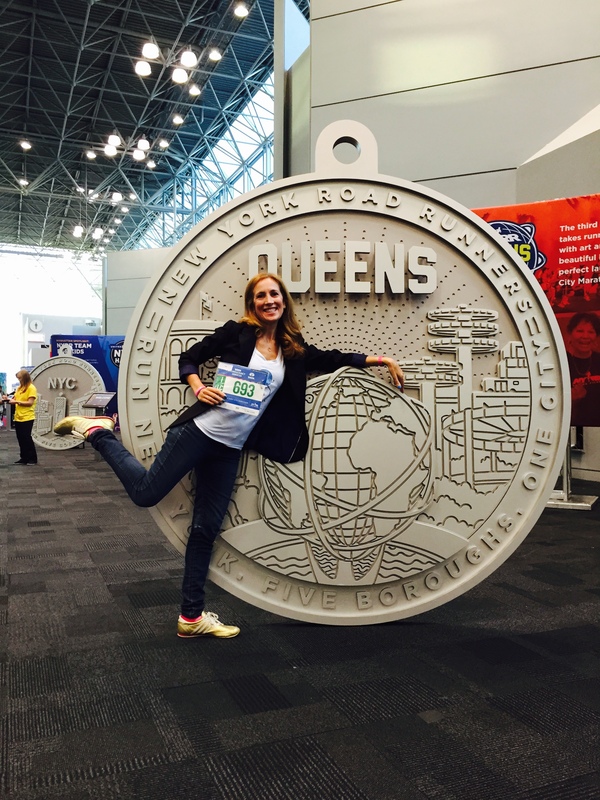 New York City Half Marathon Tips, Course Strategy and Logistics! 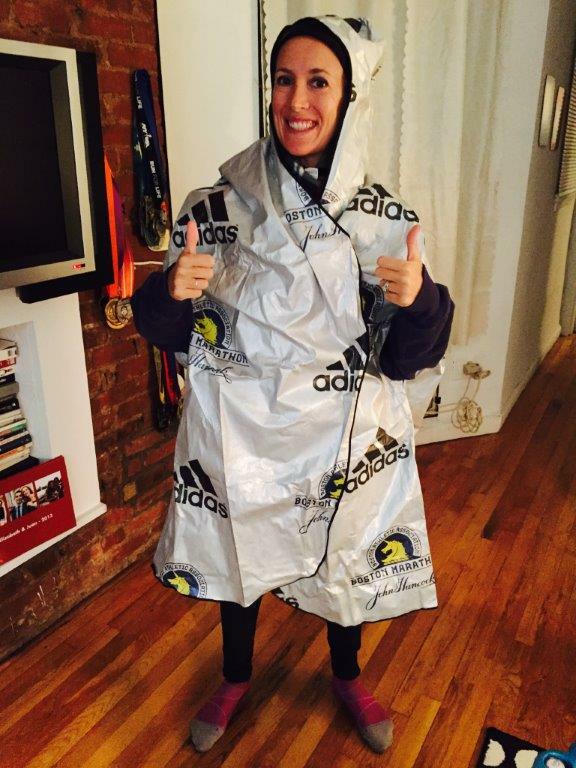 You know the “don’t wear anything new on race day” and all the basics… now, let’s do the United NYC Half Marathon as well as we can. I have done this race 7 times so far -from 2:06 in its first year, 2006, to 1:37 in 2013, and the last two, and I keep running into people who haven’t raced it and have lots of questions (post in the comments section below if you have any questions not covered here!). 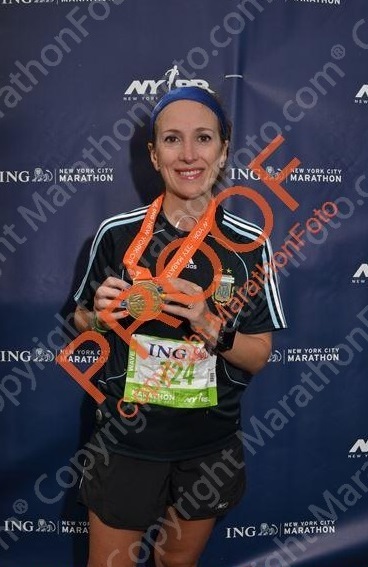 And in case you want to see photos and read my race reports, go here for all of them, or, here is the 2015 NYC Half report, here is 2014 NYC Half and 2013 NYC Half. Also, download the custom pace bracelet, I created for this race based on the race strategy below. Make a marathon list of what you’ll need a week or two before and sort it all by stages, here is a Marathon Packing List to start with. Whether, you’re travelling or not, get everything in the list ready as soon as possible. Start prepping 2 weeks out. Gear/What to wear… the weather can be anything from 50s to 20s so prepare (aka, train in) a few options and decide the day before. Or that morning. Be smart, and make sure you can peel off layers comfortably. If you don’t want to carry your phone, at least carry a $20 bill, a metrocard, and an ID with you, just in case. My rule is if it’s over 40 degrees, I do singlet and shorts (pics from last year). Last year it was 42 degrees, 60% humidity, wind 10-18 mph (2014 was 31 degrees, 2013 was 30 degrees). But depending on the wind/humidity/lack of sleep/whatever, you can add hat, arm sleeves, leg warmers, etc. Always add things you can get rid of easily and won’t miss. If you’re not sure about a layer, keep in mind that once you leave the park and get to the West Side Highway, it can get a little windy there. Check the wind direction in the morning! Best tool to have at any race: your name on your shirt, do not even question this!! If you don’t want your name, write something funny you’ll want people to scream to you all over the course. This is a big race and there will be a lot of spectators along the course and having them scream your name will make your race 100 times better. If you don’t want to ruin your gear, cut the letters our of duct tape (like I do!) and voila, they’ll peel right off! Headphones or not? If you are used to racing with headphones, bring them. I sometimes leave them on (with the music off), and turn them on only when necessary. Central Park will be CROWDED, seriously crowded, so it’s smart to keep the music off, or very low so you can hear people around you. Once you are in the West Side Highway, and it gets a little monotonous, go for it. You’ll have a lot of people cheering and you don’t want to miss it, but if you do have the music on later on, still make sure you can still hear what is happening around you!!!! 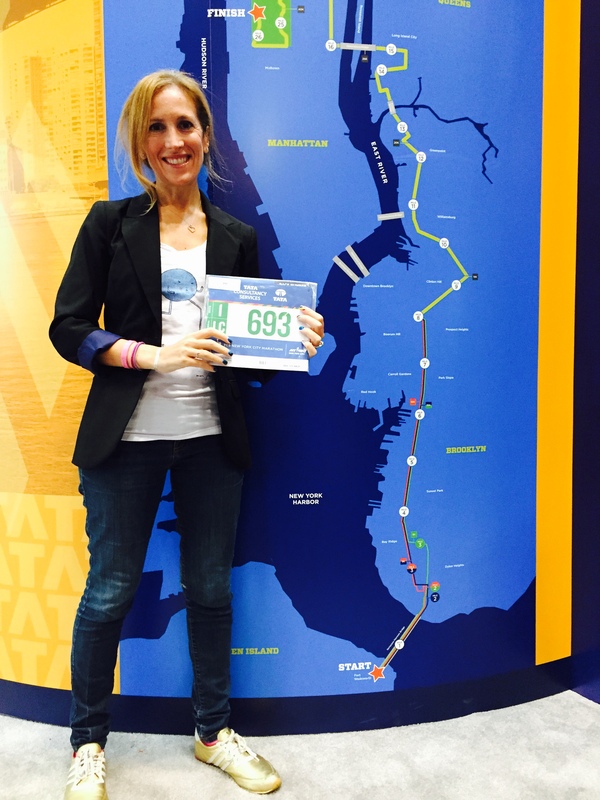 Oh, and have them download the 2016 NYC Half mobile app (will probably be ready to download a week or two before the race) where they can track you and a few more runners at a time. Get yourself the custom pace bracelet, I created for this race based on the race strategy below. There will be many starts! Last year there were waves starting from 7:30 to 8:30 (this will be updated soon) and in early march you will get a registration card with your bib/wave number and start time. Getting to the start/Baggage Check. The easiest way to get there is always a cab or running there of course, but if you have to take the train, take anything to 57th or 59th streets or any of the trains that leave you close to Central Park South/59th st. You will have to enter the park through Sixth or Fifth Avenue. Before entering, check your (nyrr provided plastic) bag outside of the park (on 59th Street, between Fifth and Seventh Avenues). Give yourself ample time (as this is weekend schedule) and check MTA for weekend alerts, or try hopstop: make sure your train is running! Also, if you are not sure, I am 100% confident that if you just head over to the closest train stop, you’ll see someone you could follow to the Start 😉 // Kiss your loved ones buh-bye, they won’t be allowed anywhere close to the Start! The race WILL be crowded, so PLEASE, if you need to stop for a walk or move sideways for water, please please please signal with your arms, and look around behind you before you make any moves, DO NOT just stop or go sideways. 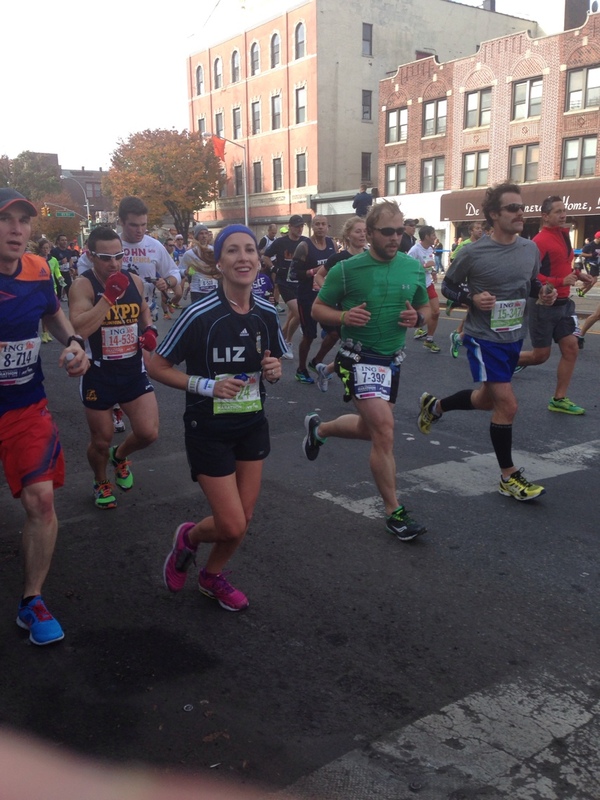 Be considerate of your fellow runners who could trip! The good side of this is that you’ll always have someone to run with, pace of, or follow when you’re tired. Pick them up when you feel strong, encourage them when they need it, and keep your eyes peeled for anyone who might need help!! Blip 1 in the course profile is 0.36 of a mile and a rise of ’33. You exit the park for two blocks, go around the Frederick Douglass Circle and come right back downhill. Then you enter the park, make a left, and start the climb for Blip 2: Harlem Hill!!! HH is 0.32 long but it has a 84′ rise (average grade of 4.4%). Fun times. As soon as you finish the downhill on the back end of HH, there’s another climb, Blip 3 is 0.60 of a mile and has a rise of ’58. Blip 1 is short and mild, blip 3 is longer but mild as it’s stretched out, but watch up for Harlem Hill, short and UPWARDS! Note: Something about Times Square can make you or your gps go crazy. Ooops. 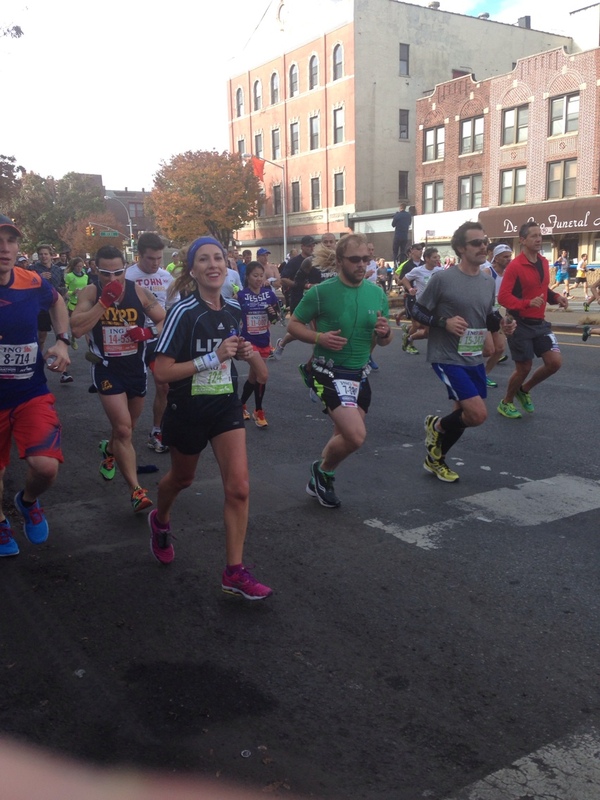 No, you’re not running a 3:20 mile. I set my gps watch to manual and I lap it myself when I see the mile markers. Way better! As you can see in the map, I obv didn’t have gps on the tunnel, and you won’t either. But it won’t matter, when you get to mile 10, or 11 or 12 and you know you’re ready to start your KICK, you go. Keep in mind there’s a little climb out of the tunnel, short but steep, and then there’s about 0.66 of a mile to go. You’ll see the 800 meters sign if you’re focused but who is at that point? It’ll seem like forever but eventually you make a left, then another left and the finish line is RIGHT THERE. So don’t wait to see it to sprint and wait a few seconds! Walk, get your medal, take pictures, get your stuff, find your friends/family, go get brunch (there are many good places downtown), enjoy, stretch, ice bath, rest, eat more, sleeeeeep! 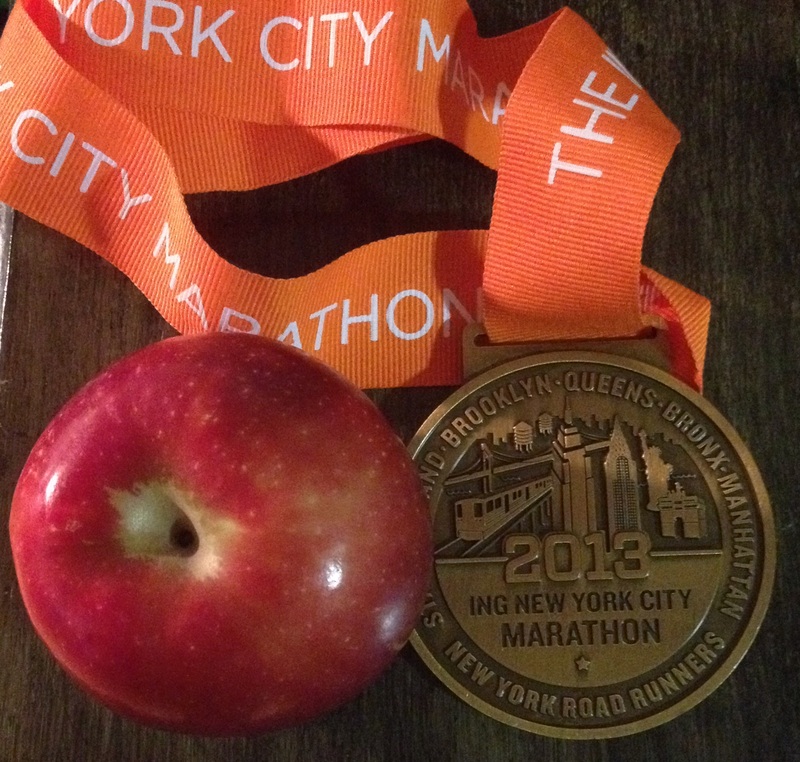 Tell everyone about your race, plan your next race, have a congratulatory donut. Or at least that’s what I am planning to do, even if this might be my slowest half!! 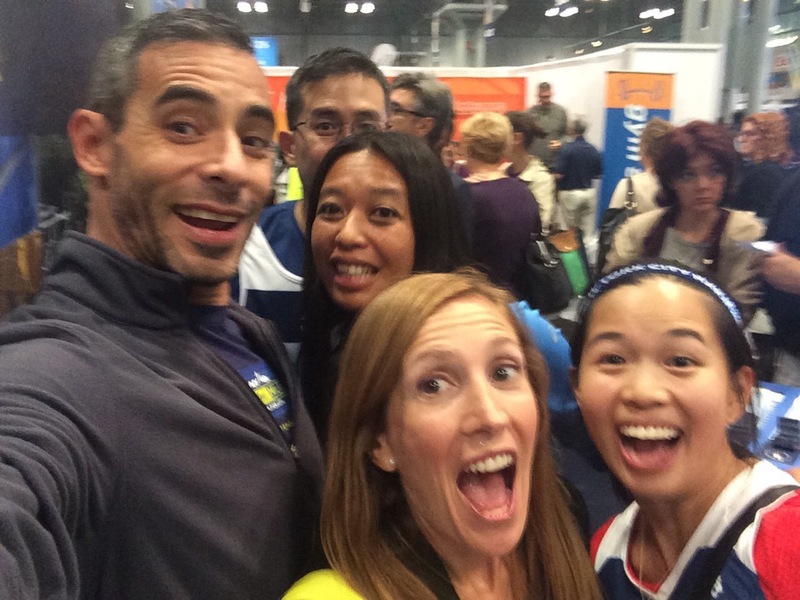 New York City Marathon Media and Elite Runners, and the Winners! 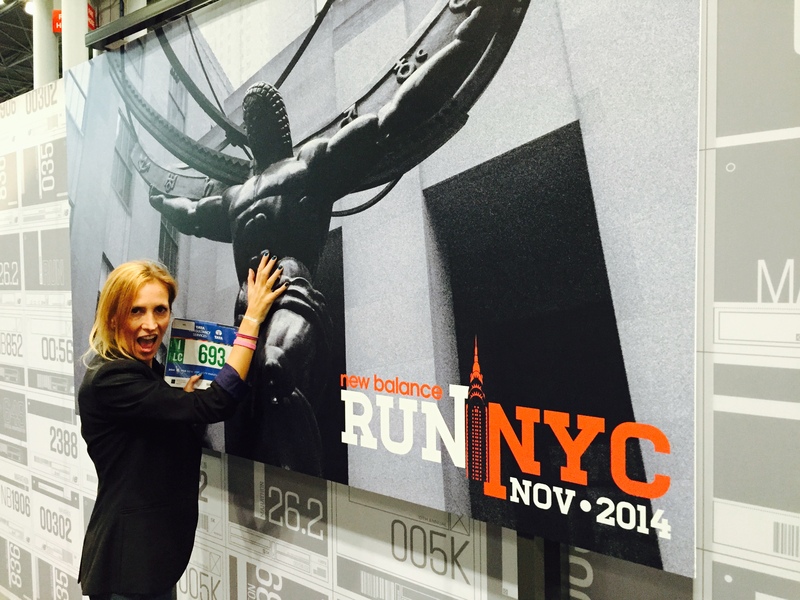 New York City Marathon Expo — lots of pictures! 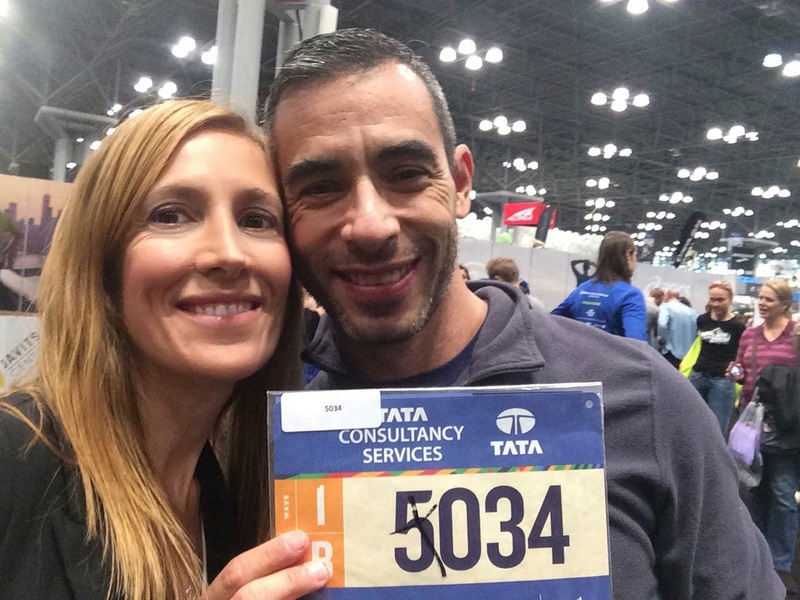 My 2013 New York City Marathon Race, PART 1! 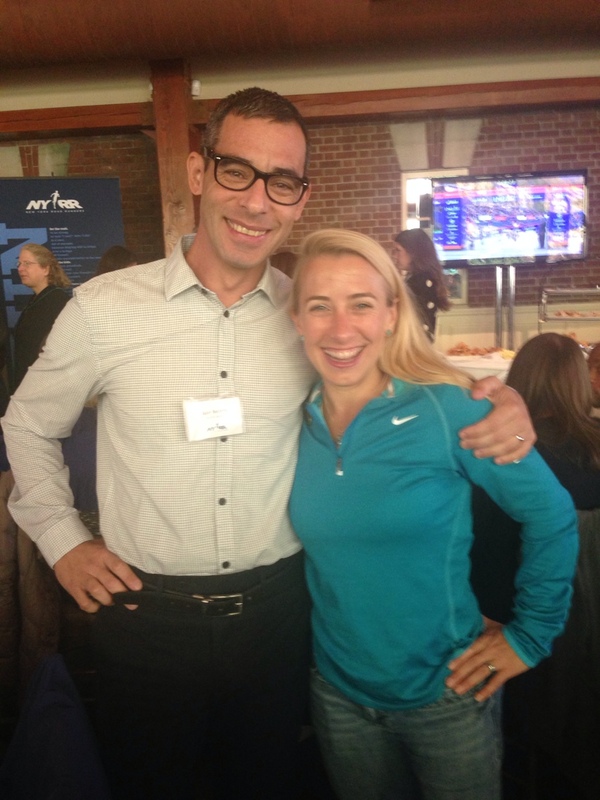 Monday, early, I ALWAYS go to the NYRR Charity Breakfast. I seem to always be there with a different charity but I am always there. After all, I can’t sleep, the clocks have changed I and I wake up early, there’s food, friends, a walk in Central Park to clear some lactic acid, and always some celebrity. Juan came with me, and the walk to the park was slow but comforting. As well as the cold weather. I met a lot friends, colleagues, ex-coworkers, and more friends. A friend told me to sit at his table, right there, and we ended up sitting by Ethan Zhon, american soccer player, Survivor winner and he also has his own charity! We are chit-chatting with everyone and two seconds later, I look up and Ed Norton was sitting on my table. Crazy world. 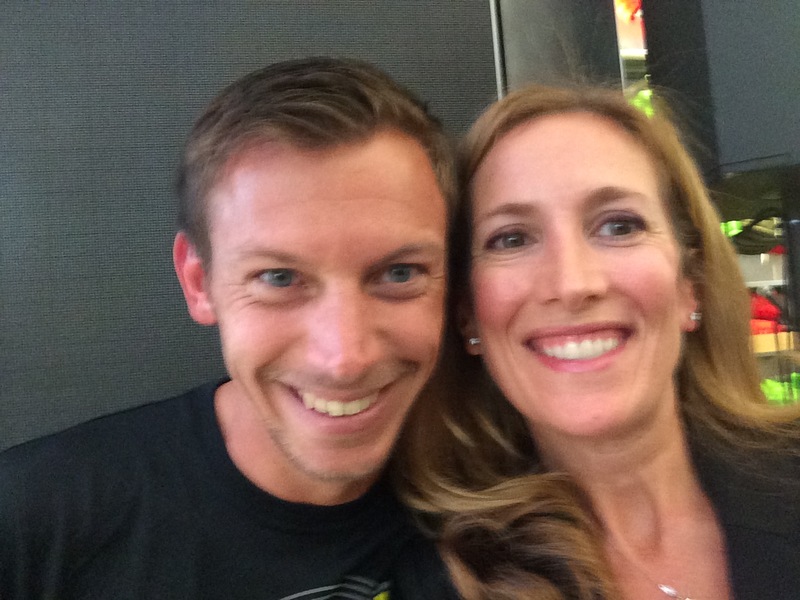 I figured he’d be the guest speaker, as he had done it once before, but no… it was someone I didn’t know, Sarah Reinertsen, and all of a sudden Juan is flapping and flipping “she’s the reason I got into Triathlon!! !“, “Sorry honey, I love you but I have huge crush on HER! !“… unstoppable stuff like that… so funny. And I was like… who??? 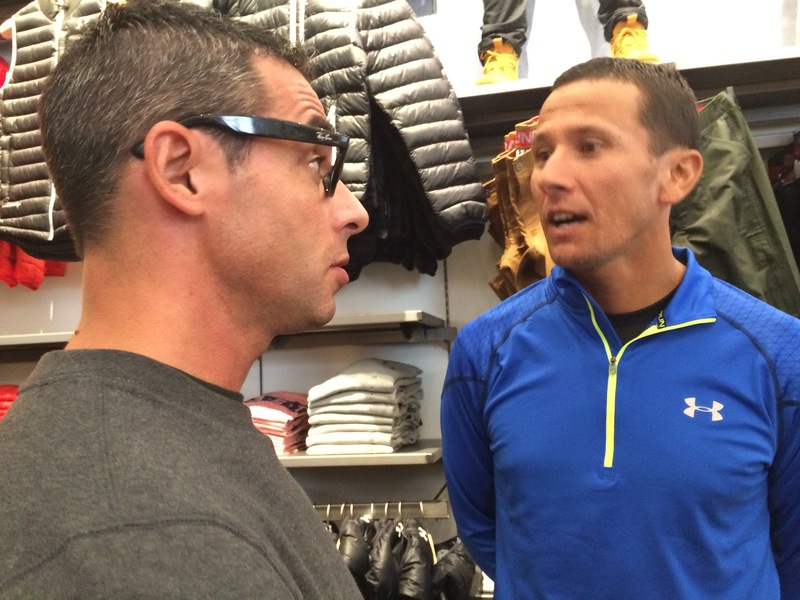 I admit I don’t know much about triathletes… he set me straight right away. 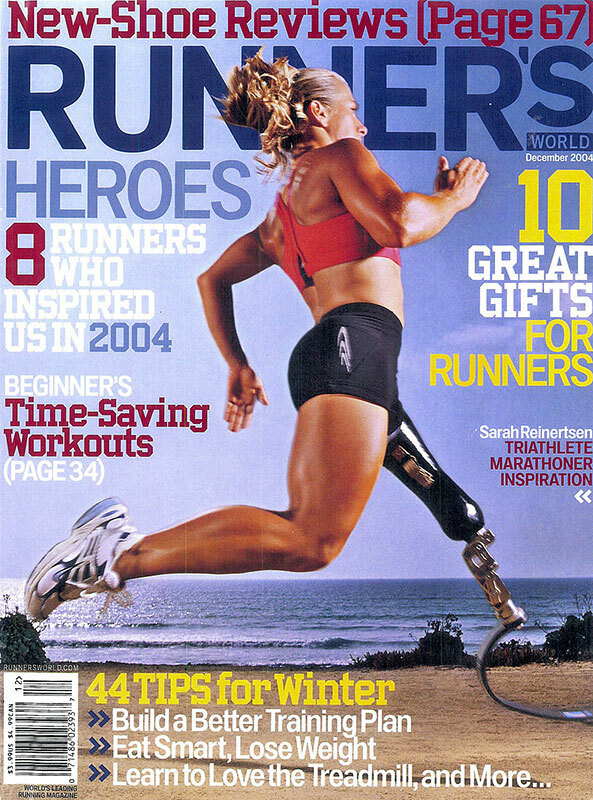 Wikipedia: She’s an American triathlete and former Paralympic track athlete. 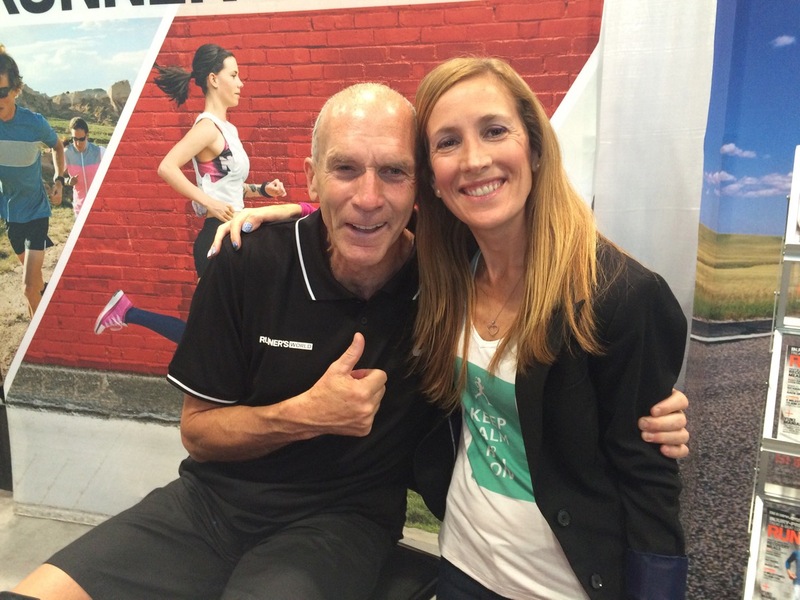 Reinertsen was the first female leg amputee to complete the Ironman World Championship in Kona, Hawaii. 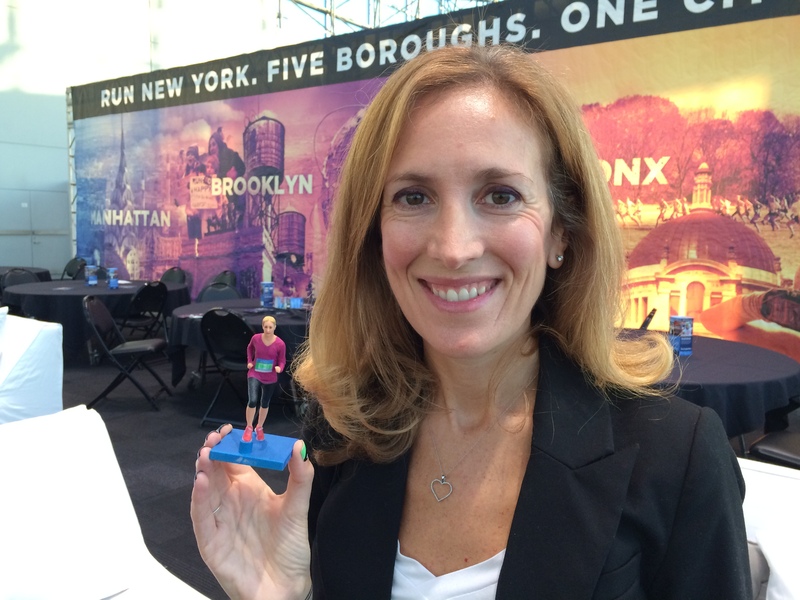 Reinertsen has broken the women’s above-knee amputee marathon record several times. Anyway, I had no idea. And OMG she has a story… it was so amazing to hear her talk. You might have to get her book but this girl is INCREDIBLE. I was so moved, in seconds, I suddenly had a crush on her too! Instantly! Once it was all said and done, Juan and I went to say hello. emmmm, she also speaks Spanish. She’s amazing, period!!! Well, he was giddy for a bit. An hour. Or two. 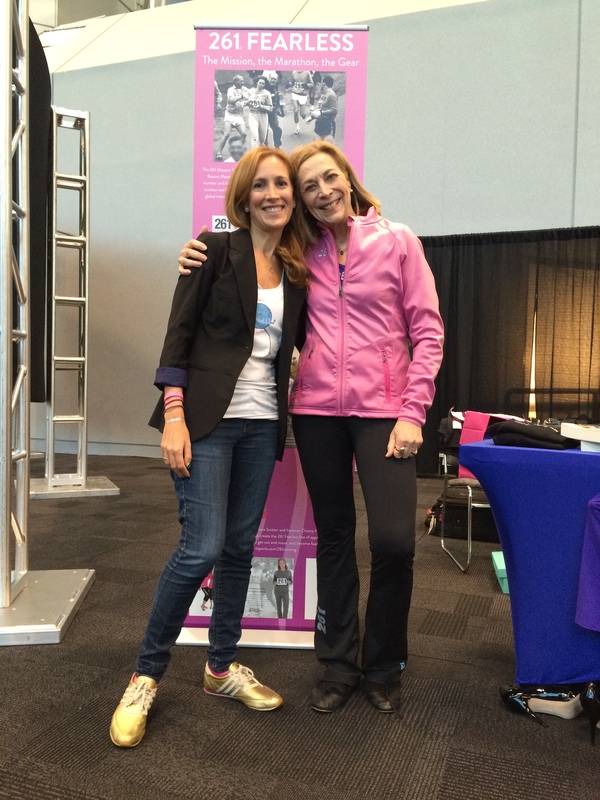 I loved hearing her story and meeting. Inspiration Maximus Activated! 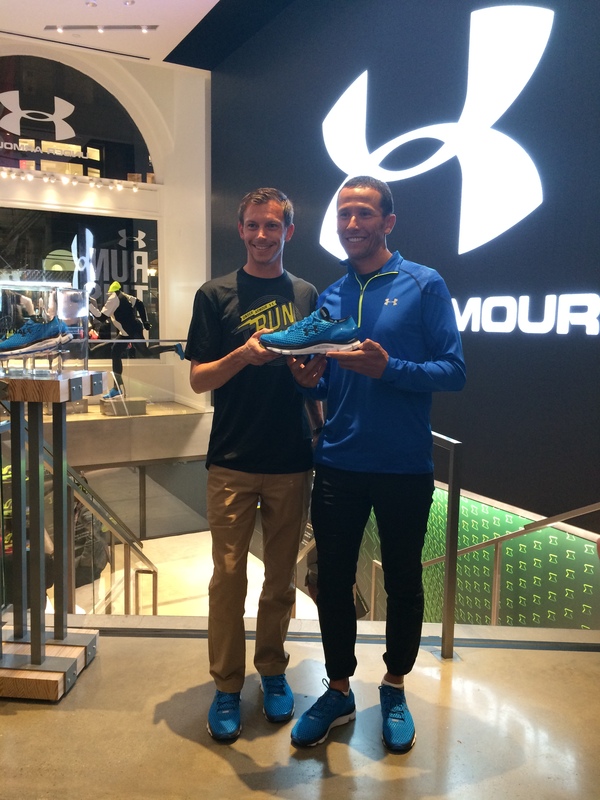 and we went to the Monday Marathon store… and soon to the elites conference, which I’ve blogged about -I met both winners!!! 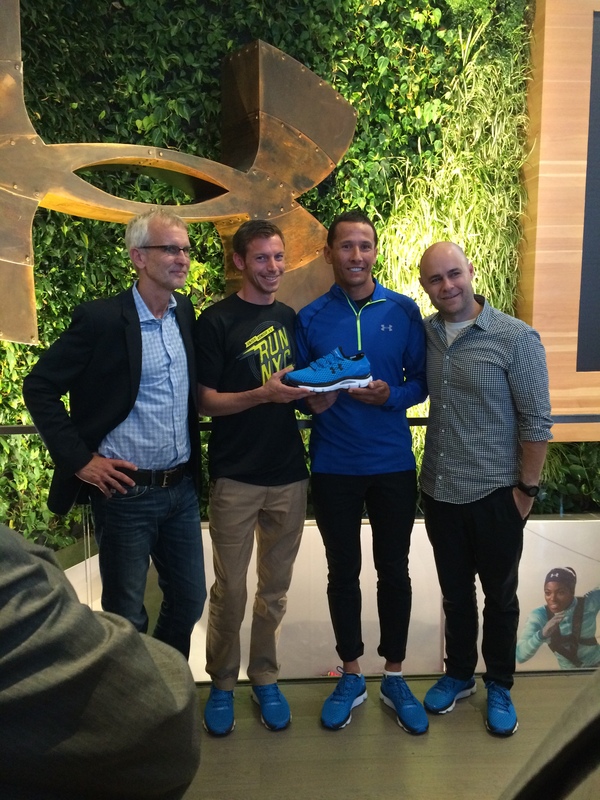 : New York City Marathon Media and Elite Runners, and the Winners! My first drink in years. I earned this. Sorry everyone around me! —Comment happily: you won’t be asked to create an account! A lot of friends passed me. Lots and lots of people. And still, I was going way too fast. I couldn’t control my speed, my heart rate, my head was spinning with fear and panic… I felt like someone who is trying not to drown so they patter around frantically wasting all their energy helplessly. I knew I was making things worse. I just couldn’t stop it. 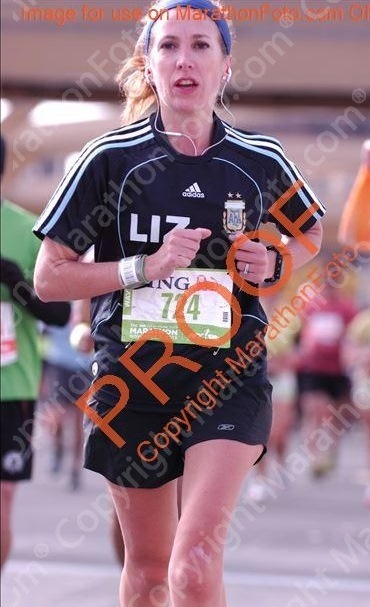 I had brought a 3:40 pace bracelet for kicks (far from my last marathon at 3:27 but still a good point reference for me). I figured that, if I was doing anything slower than that, I would not need a pace bracelet. 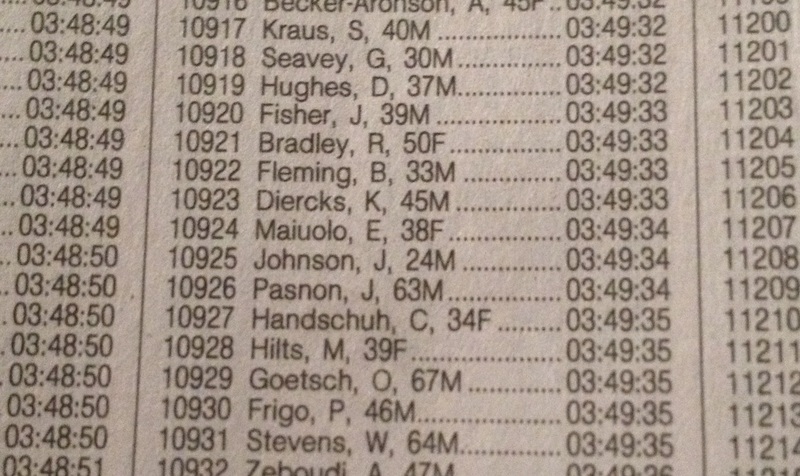 Average pace for 3:40 is 8:25. So the first mile with the uphill and all was a bit INSANE at 8:35. Seriously. I KNEW I had already ruined the race because I was going bonkers. I had already also started crying a bit early. I missed running. I hadn’t run in two weeks. 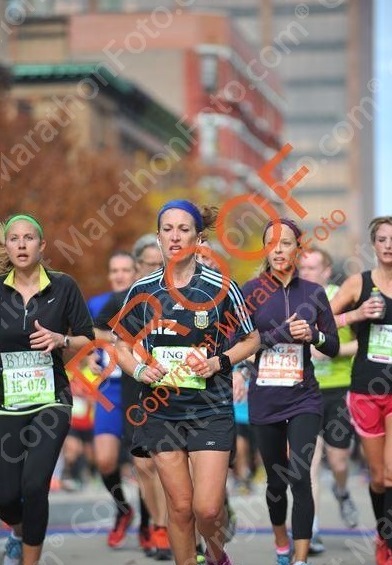 I hadn’t done this marathon in two years, and 2011 was so different doing the Footlocker Five Boro Challenge. I was nervous and crying hysterically this early, no good. Still going so fast… but, in EVERY SINGLE OTHER RACE I ever did, I ALWAYS thought I started too fast and got scared. And I always thought there was no way I could sustain that speed and I always did maintain it. I always know how to pace. It’s my thing. I pace well. I start easy and finish super strong. What if this time it would be the same thing as every single other race? I really wanted to believe it but my legs felt dead, my heart rate was insanely high at 184 average for the first mile… I knew I had to slow down, but my brain wasn’t trained to have any control over my untrained legs. I was like a drunk person or a child that had too much candy and there was nothing I could do from the control room. We could hear and feel the wind. 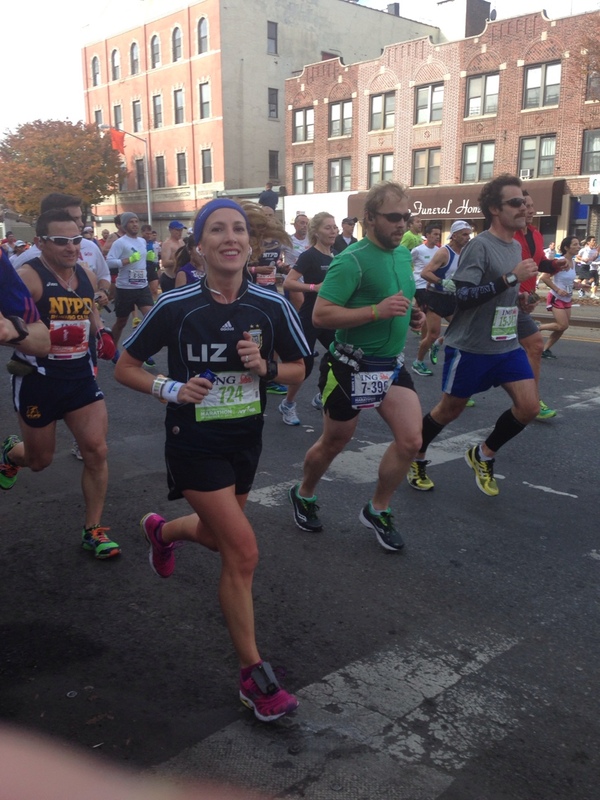 It was on our side so it wasn’t that much trouble in the lower deck, but I wondered how long should I keep my layers on… and what would happen when we left the Verrazano… Mile 2 was 6:46, ridiculously fast, but I was on the same uncontrollable panic mode. And my legs were dead going downhill… that’s never a good sign. My legs usually LOVE downhills! Pretending to know what I am doing. good, right? We left the bridge, I started getting really warm and finished shedding my layers. 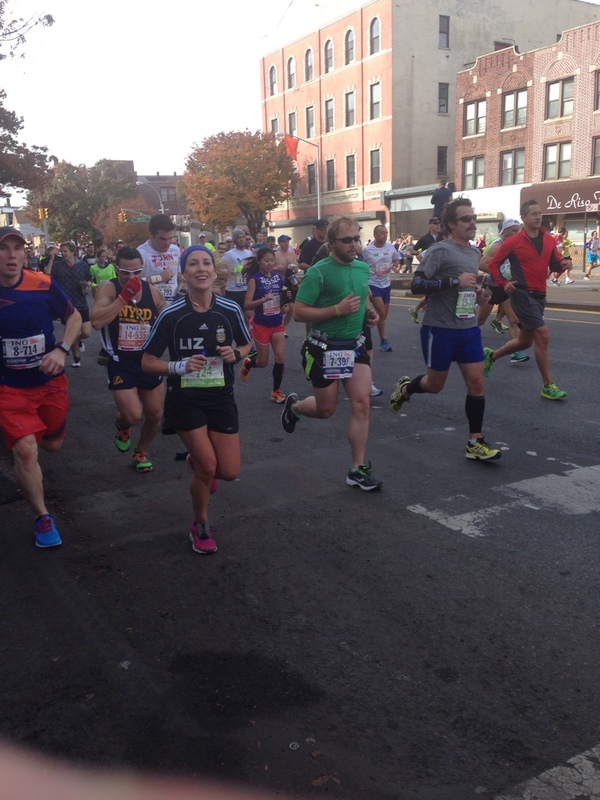 We run through the back streets of Bay Ridge and I noticed how many people were out there. SO MANY. 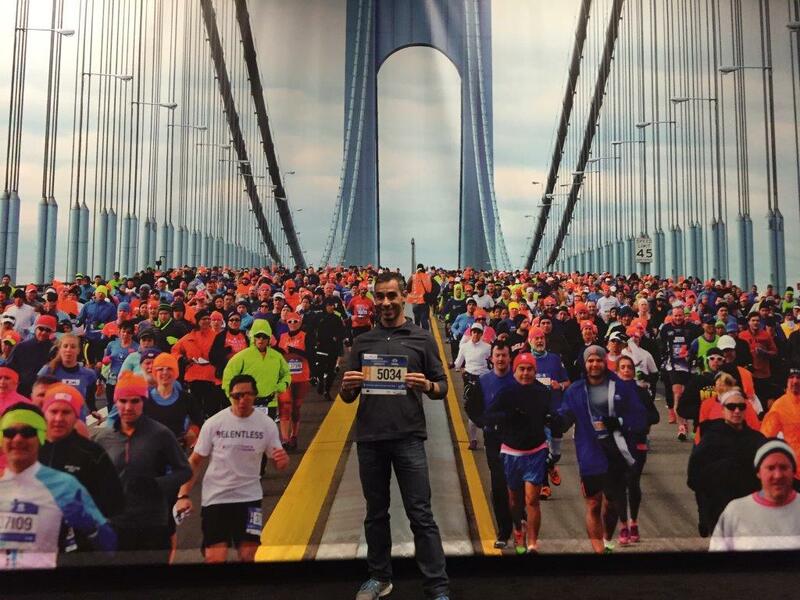 I have done every NYC Marathon since 2008 and I had never seen soooo many spectators. It was exciting and I could barely enjoy it. 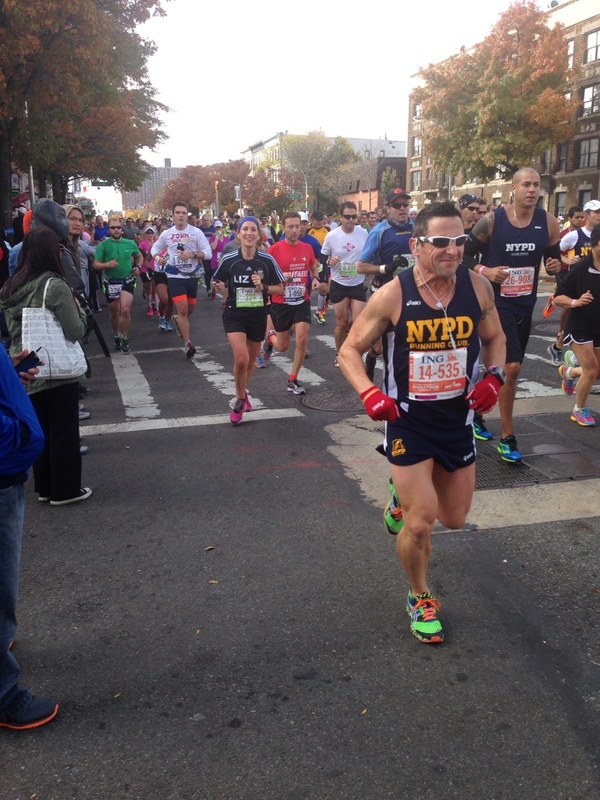 Soon enough, we turned onto Fourth Avenue, and, still crowded I clock Mile 3 at 8, so my first 5K was at 8:01 average. I knew it was unsustainable, but there was nothing I could do at this point. It was a mess already. I knew though, that I’d see Juan in a couple of minutes, and that was my first out. I decided I would keep going, my leg wasn’t hurting and, though slow, I could keep going. Soon, I spotted him in our prearranged corner, exchanged kisses, told him how I felt and kept at it. Trying to reign it in. To no avail of course. Brooklyn turned into a blur. 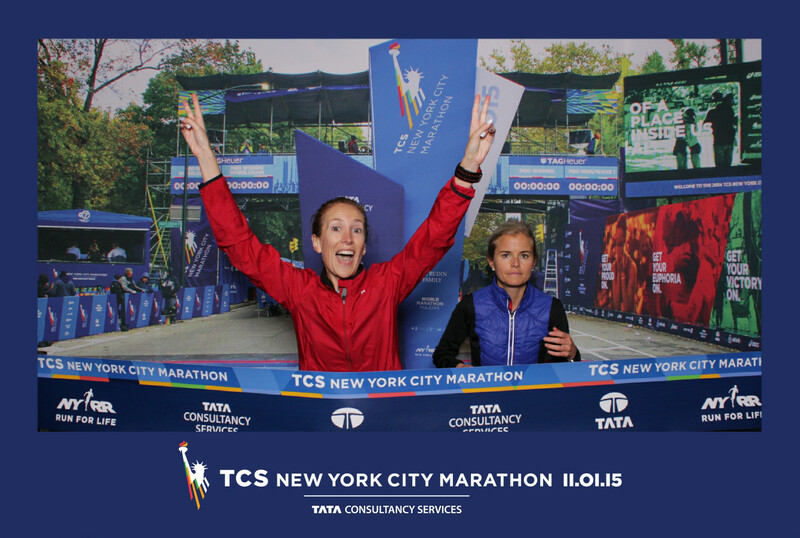 I realized I was tired and I couldn’t keep myself interested in the crowds, the fun, the city, the course. Pretty much, I was not enjoying it. I mostly put the music up, went to the middle of the road, looked down, and tried to focus on just one more step. One. More. Step. 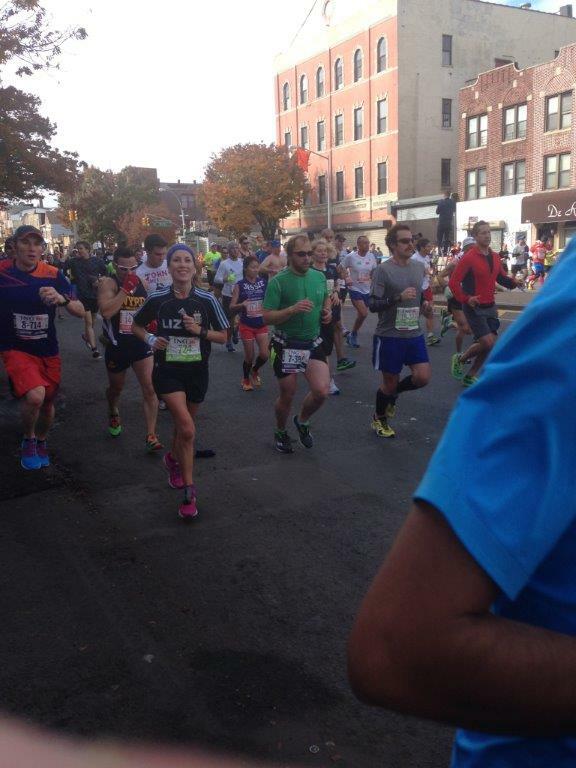 Mile 4: 7:45, Mile 5: 7:43, Mile 6: 8:00, Mile 7: 7:53, Mile 8: 8:02, Mile 9: 8:06, Mile 10: 8:11. My 15K was average 8:06. 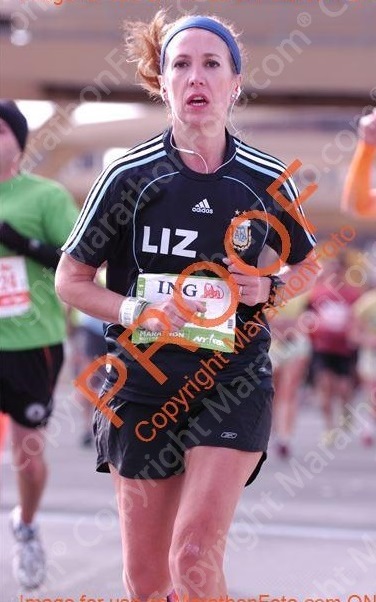 Somehow I was keeping a REALLY fast PACE. According to my pace bracelet I was 2 minutes and a half sub 3:40. Emm, am I capable of a 3:37? NO WAY. But my legs were doing whatever they wanted. 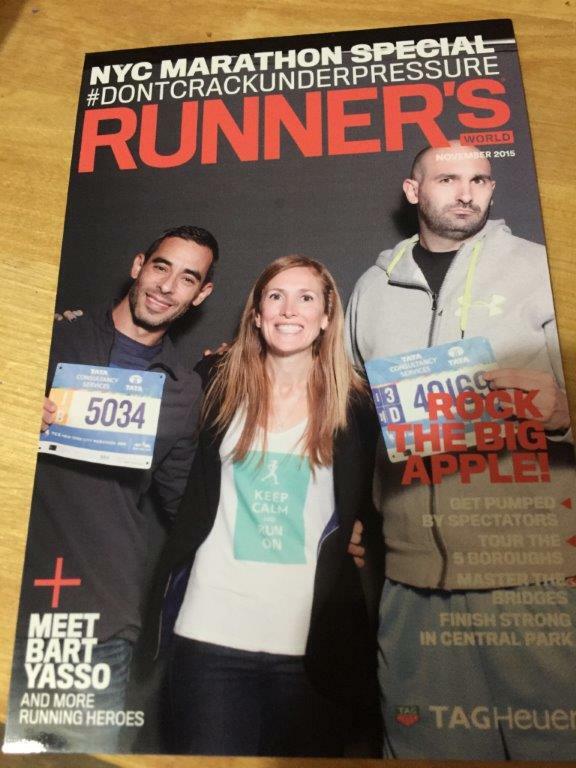 I’d later realize they didn’t know we were doing a marathon, they though it was a half marathon…. I kept at it, one step at a time. I cried a lot. I was just feeling slow, tired… and things started to get worse. The thought of Michelle waiting in her PJs on Bedford kept me going for a while. I was just SO thankful she was there, just like she does every year! 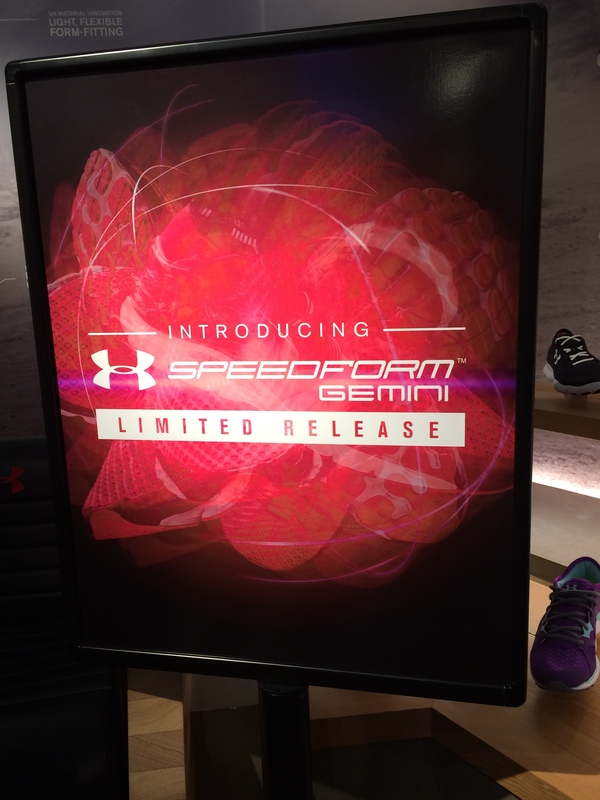 Mile 11: 8:30, Mile 12: 8:09, Mile 13: 8:25, Mile 14: 8:44. Going up the Queensboro I didn’t stop to walk like so many people but I FELT like I was walking… Mile 15: 9:52, Mile 16: 10:23, getting off the Queensboro was not the high I always experienced. I had to make a decision. 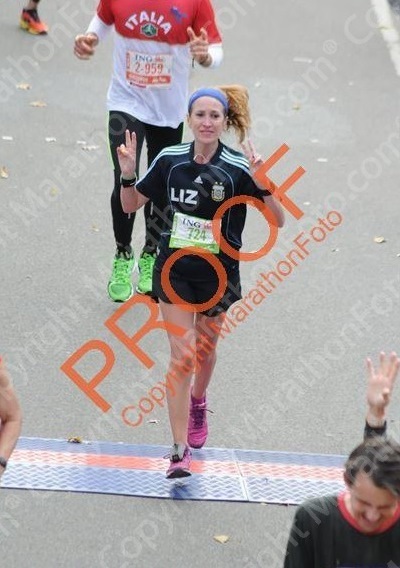 If I was to end the race, I was seeing Juan at Mile 18, I could just stay with him. 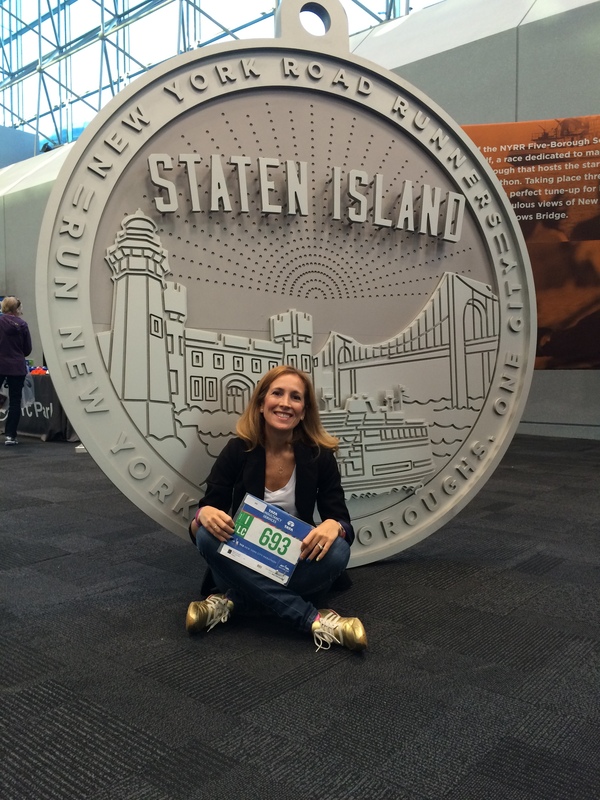 I was getting slower and slower… I decided that I was NOT GOING TO WALK. AT ALL. And that as soon as I started walking, I was going to walk straight home. NO WALKING. HANG IN THERE and finish this thing. My 5K splits were dropping like crazy. Pace at 20K was 8:22, at 30K I was at 8:28 and it just kept getting worse and worse. I was past my 3:40 pace bracelet pace now. Around 80th Street I saw my friends Katy and Mikhail who made me feel so good and around 117th I knew I’d see Juan and my team mates! That kept me going for a while. 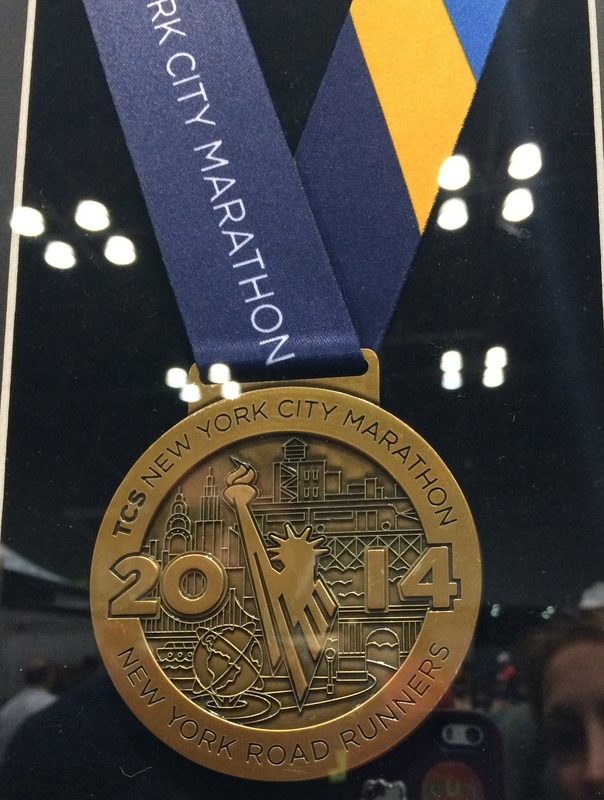 But I kept going: Mile 17: 9:49, Mile 18: 8:49, Mile 19: 8:56. BAD going towards Fifth Avenue WORSE and Central Park Worst. 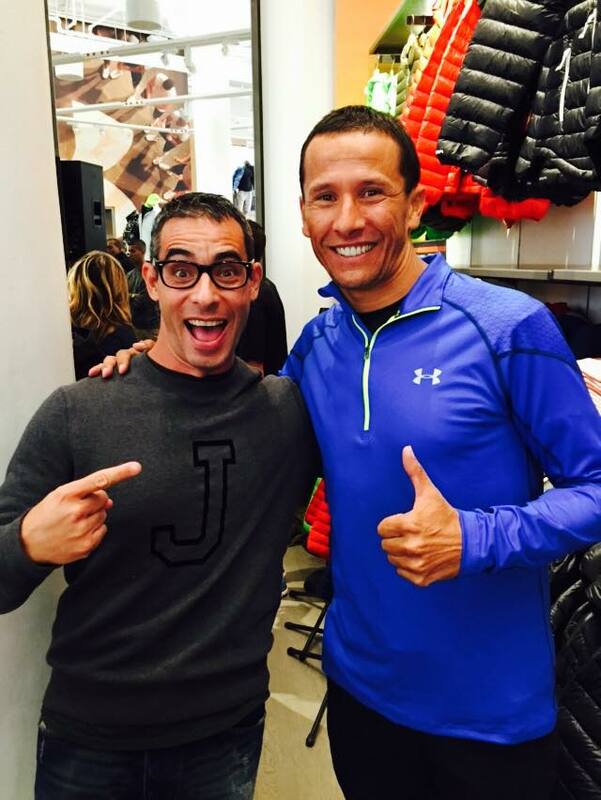 I knew Juan was coming ready in tights to run if needed, and I debated whether I wanted company for the 3 miles into the Bronx. I decided to go at it alone. If he was with me, I’d start complaining, he’d tell me how great I was doing and I’d start hating him. I’d rather shut it all down and just haul to the finish as dissociated from what was happening as possible. I spotted the Dashing Whippets, did the continuous high-five as best as I could (see how low/tired my arm is?) but I was really happy to see them all! One thing I had started doing was to stop crying when I knew I would see Juan. I didn’t want him to worry or try to come with me. Then, before getting into the Bronx, I spotted Ben, who always makes me smile!!! The Willis bridge into the Bronx felt like I was climbing the Empire State Building. I am not exaggerating. I have climbed the ESB! See how miserable I look? 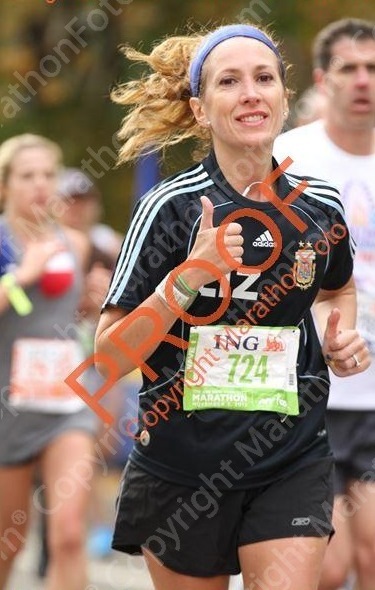 If you have seen ONE of my race reports, you know I know how to look good in race photos, marathons or whatever they are. These are just my worst pictures ever. But… the BRONX was bopping!!! It was as crowded as I’ve ever seen it!!!! It was so much fun. There were funny signs and somehow I noticed! Plus I saw two team-mates and shouted around a lot. Photo Credit: Luciano Rezende. Can you figure out what’s on my shirt? 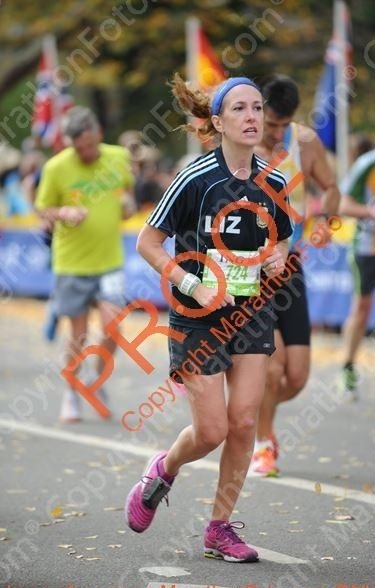 And when you don’t think it can get worse, it does: Mile 20: 9:14, Mile 21: 9:47, Mile 22: 8:58... I saw Mary Arnold there, just because she was shouting my name like I was drowning. Everything was a blur. I just focused on getting to Fifth and 109 where I’d see Juan again, and then Patricia at 98… I just kept looking at the street numbers but they took SO long to get to me. I really felt like I was walking and if I had looked at my watch I would have noticed why… Mile 23: 9:07, Mile 24: 9:26. Somehow I managed to get to the park. And I just didn’t want to keep going. I would have given anything to convince myself to turn left at 90th and go home. The park wasn’t as crowded as other years, so I managed to see a few friends there (Marvin, you almost made me stop with that sign!). Counting my steps to the finish line. Those were the longest three miles of my life. I was completely demoralized, depressed, upset. I felt like an idiot. How could I ruin this day?? 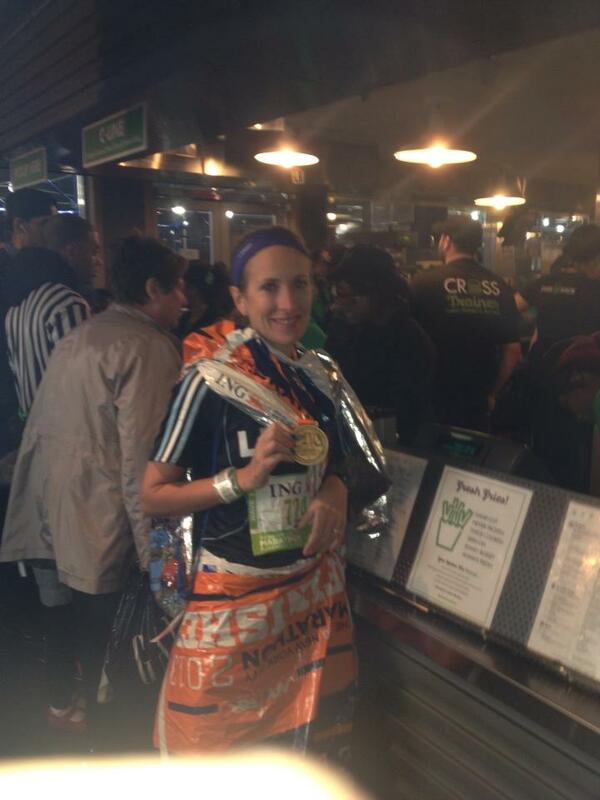 I knew I would finish but I didn’t want my marathon to be this type of experience… I was really upset with myself. I knew I should NOT have run it. 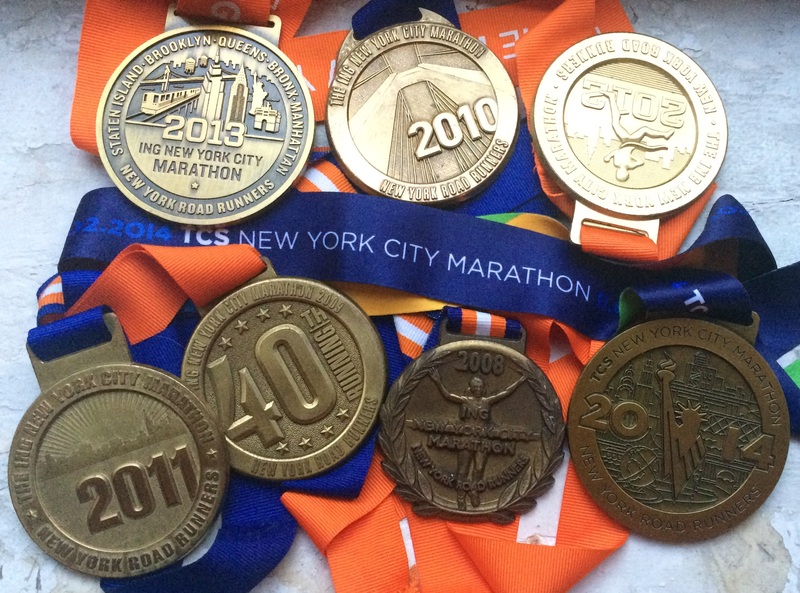 I had done 10 marathons and ultra and I never felt this bad. I’d run injured before, I had run slower times, but this was just a horrible idea. I started heaving and crying again. 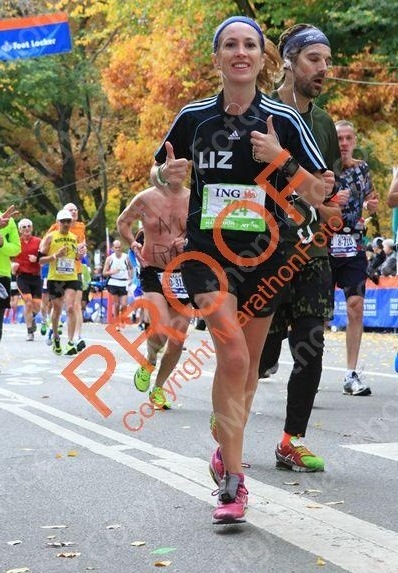 So much that runners around me tried to calm me down and tell me I was so close and I was doing great. I wasn’t. I just wanted it to be over. Faking happiness for the camera!!! 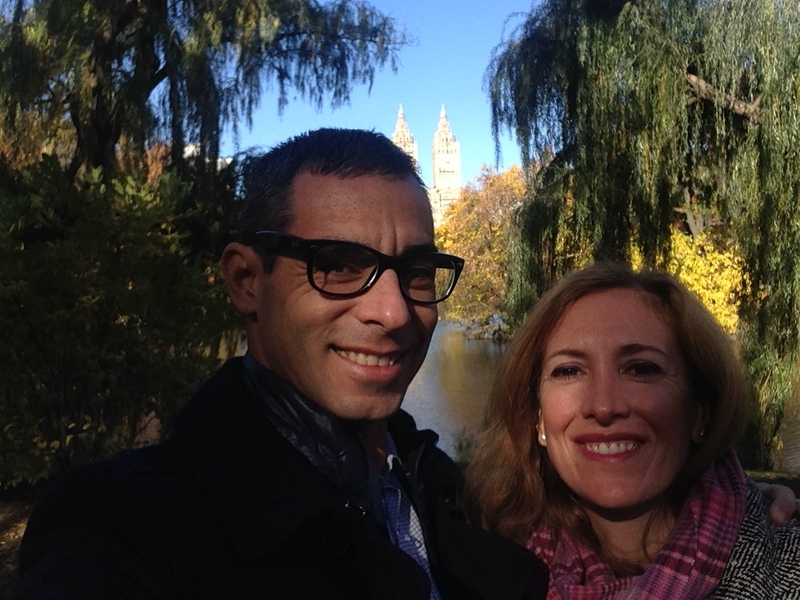 When I turned on Central Park West, I thought I was almost done. Wow, those blocks felt like 10 miles. I felt like I was walking and I couldn’t finish soon enough. 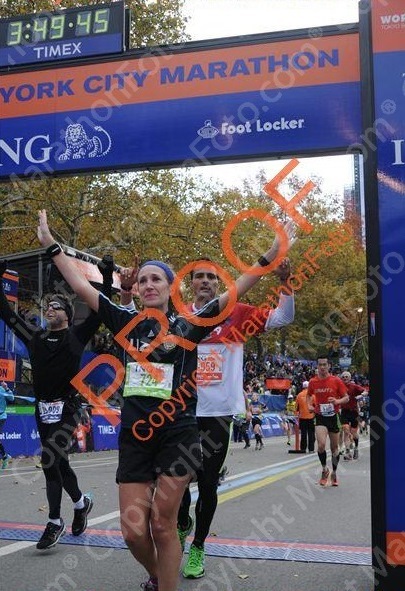 I was still crying all my way up to the finish line. Mile 25: 9: 07, Mile 26: 8:56. I finished. There was no happiness. There was no glory. 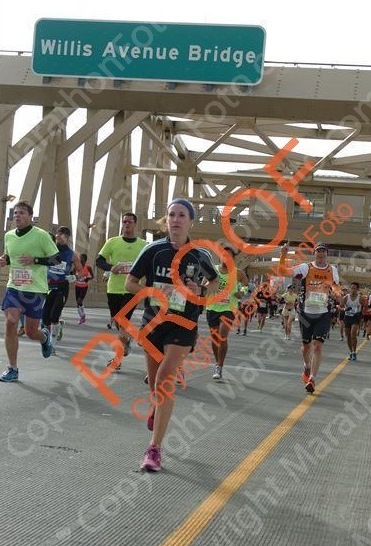 I was still/already crying when I crossed the line. It took about 3:49:34. The time was fine, not my slowest (still within my 4 hour forever limit), far from my fastest. The time wasn’t the issue. My problem was that I was so way over my head about what I could do that I ruined the day. I ruined the most precious day of the year. I don’t blame myself for not training, I didn’t have a choice there. But I should have skipped the race. And I should have started 2 corrals back with someone shooting for 4 hours to help me pace right. I let my untrained brain trick me, and I don’t like acting stooopid. 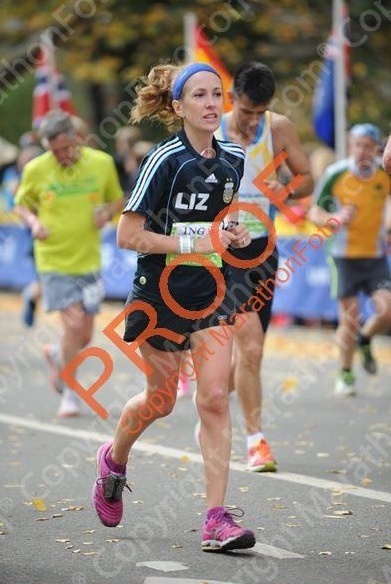 And now I know what happens when I DON’T TRAIN FOR A MARATHON. I am just a miserable person, who wants to go home, has no fun whatsoever in the best race ever, can’t control the pace, and positive splitted like a maniac. I don’t want to be that person ever again. Please smack me in the head if I ever attempt to do something this stooopid again. Worst possible race splits in the history of racing. I ended #10908 of 50,304. Overall Gender Place: 2,076 of 19,579. These are the worst ever too. Can someone be this dumb??? 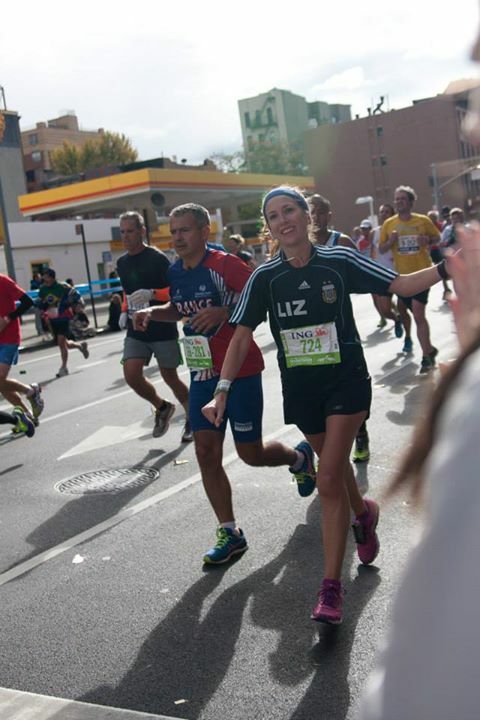 Once I stopped running I started crying more. I cried the 500 blocks to my UPS truck, all the way from 67th street to 85th, that’s a LONG walk. Then I cried some more. As soon as I put one foot outside the park, Juan caught me and we both cried for like 10 minutes. 10 minutes later I was at Shake Shack, this man is a keeper. What else other than Shake Shack could anyone possible want? I kept crying. I was upset. 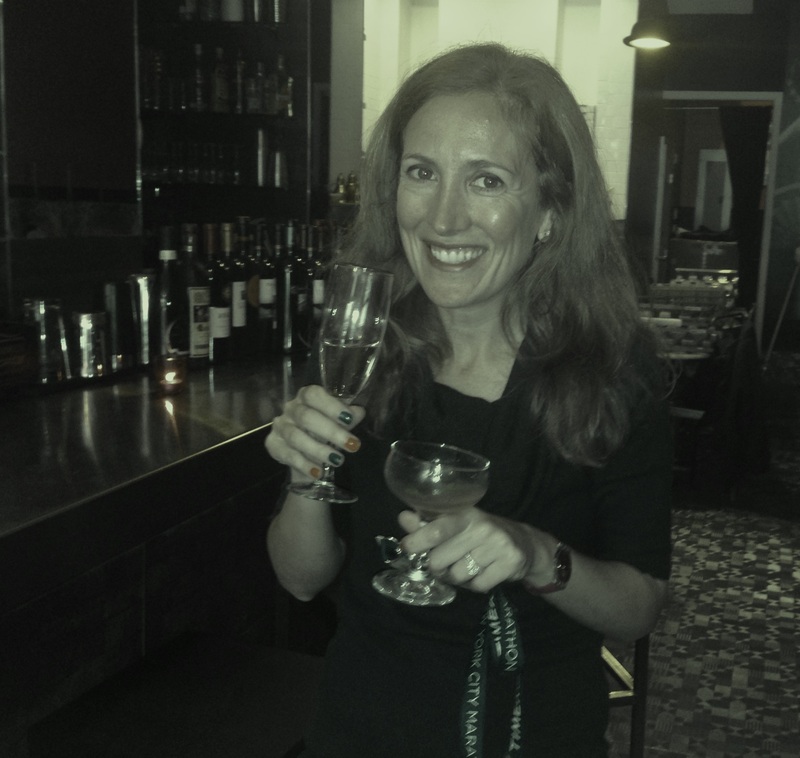 I skipped all the parties and reunions because I couldn’t ruin everybody else’s day… I kept telling Juan I needed to get off my sweaty bra because I was sure I was as chafed as raw meat. Went in the shower with no issues. Turns out, my diaphragm was hurting from so much crying, or heaving, or breathing hard. My ribs hurt for two days. I want to pretend I learned the lesson. But I am way too stubborn. 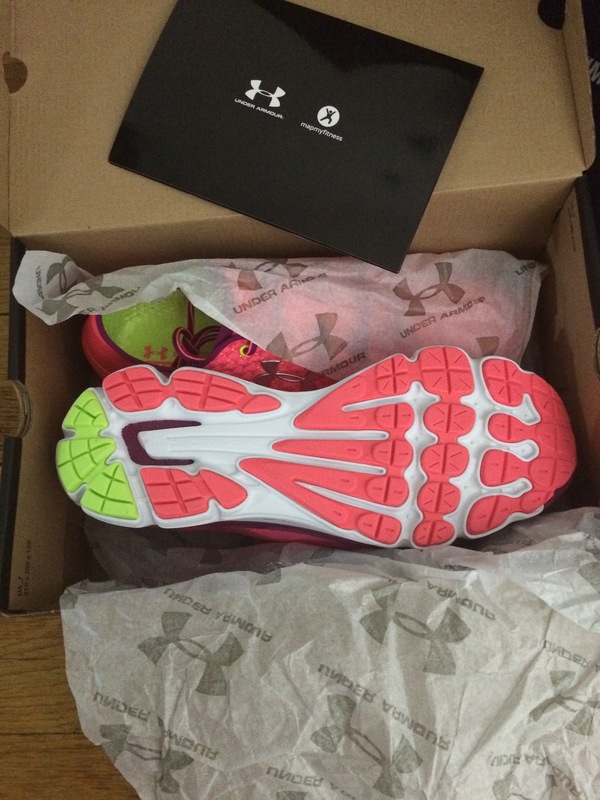 And I love running too much. I just hope I am smarter next time.